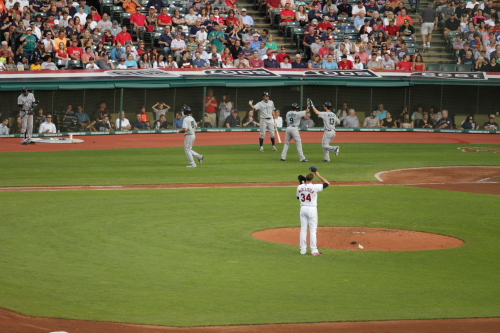 Indians rain dance can’t stop the Mudhens! 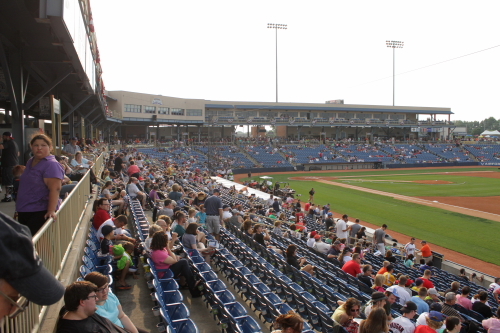 The Mudhens are the triple A affiliate of the Detroit Tigers. Game 14 of road trip been forgetting the double header in Burlington! The game time on the sign said 7:05 but due to a rain storm earlier the game was delayed to a 7:25 start. This is the 5th time I have been to Victory Field. I have family in Indy so I always go to an Indians game when I am visiting them. 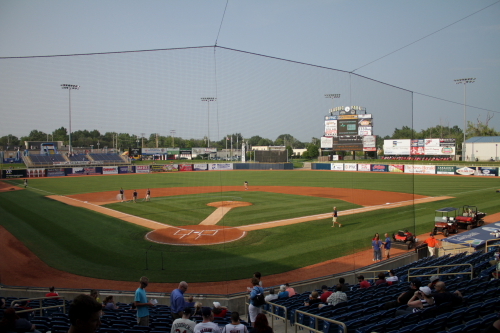 This is one of my favorite stadiums along with Durham and Greensboro. 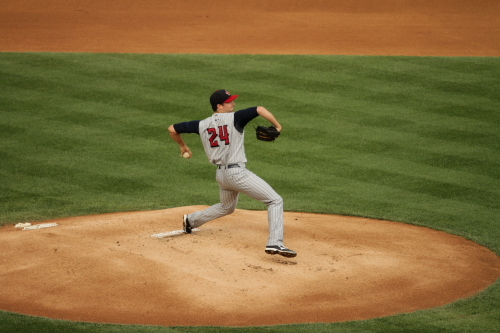 Nick Kingham was the starting pitcher for the Indians this game. 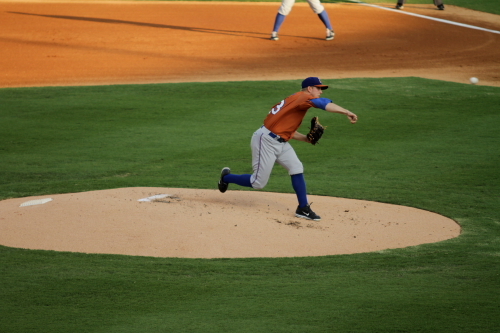 Hernan Perez popped out for the first out of the inning. 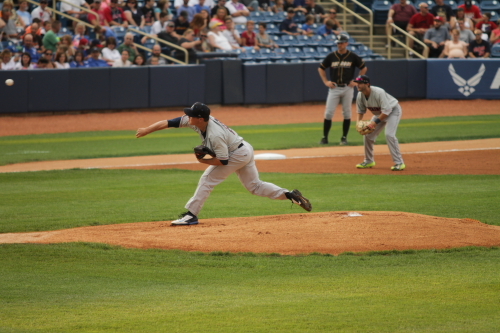 Kingham faced 4 Mudhens batters in the 1st. I batter did get on base, James McCann hit a single with 2 outs. Robbie Ray started for the Mudhens he started the game by striking out Starling Marte who was on a rehab assignment from the Pirates. 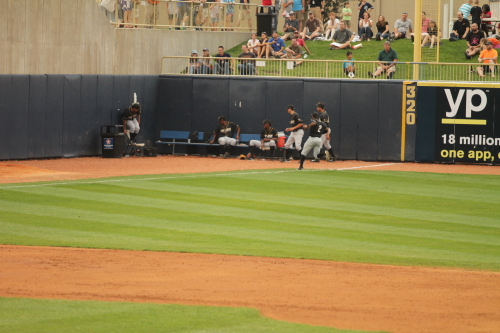 Jose Tabata hit a single and Andrew Lambo hit into a double play to end the inning. 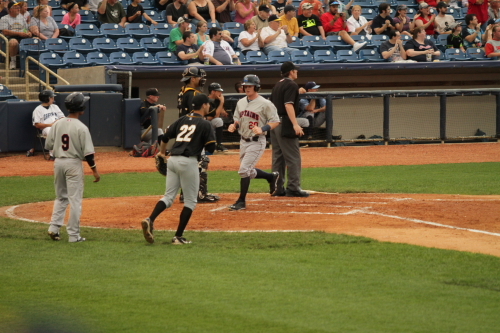 Tyler Collins hit the ball for an out to lead off the second inning for the Mudhens. They would be retired in order in the 2nd. Indians All-Star 1st. 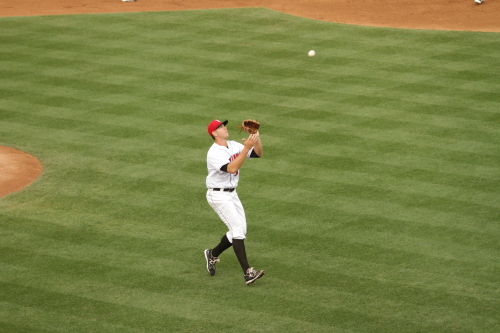 baseman Matt Hague popped up to start the 2nd for the Indians. 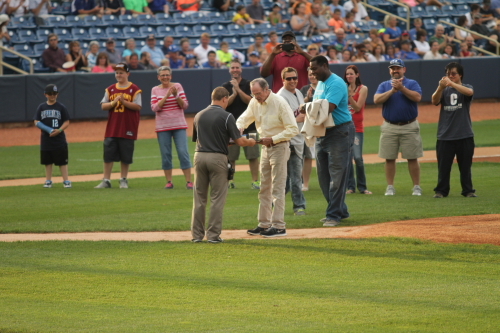 He popped up to the Mudhens shortstop Perez. 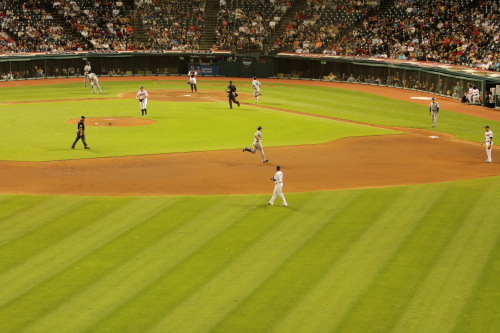 The Indians had some good opportunities in the 2nd after they had 3 runners all getting on by walk and were not able to get a run home. 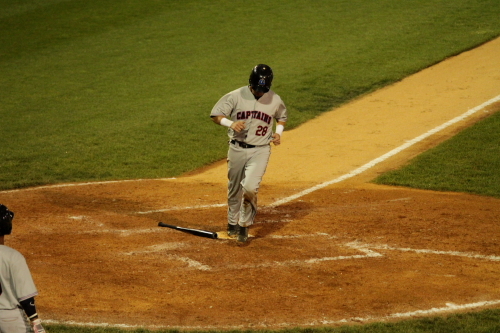 Blake Davis was the 3rd walk to load the base’s with 2 outs. 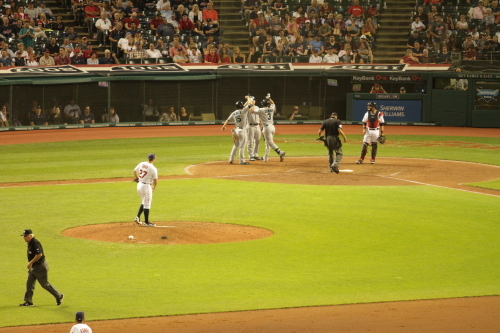 Robert Andino struck out to end the inning and the Indians left all 3 runners on base. 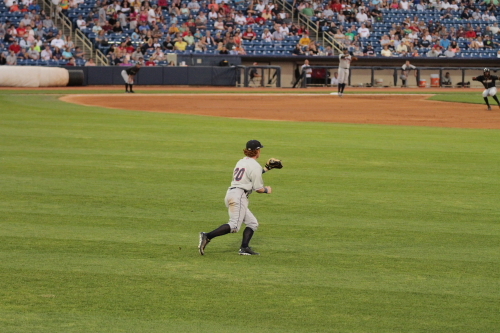 The Mudhens got things going in the 3rd. 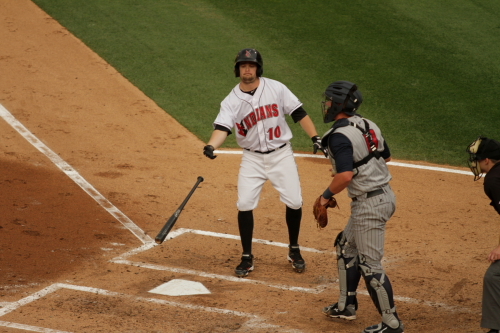 Danny Worth hit a double with Wade Gaynor on base. 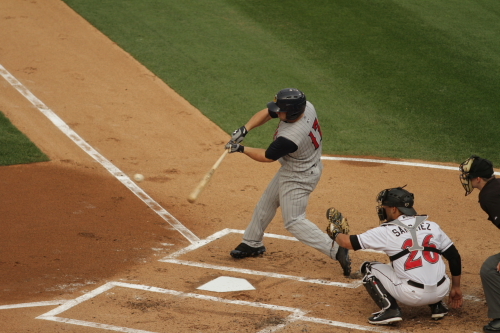 The ball was hit to the right field corner. 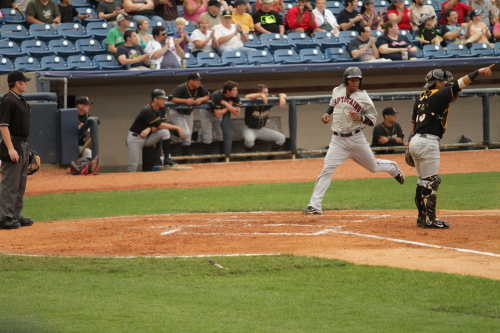 Gaynor scored and the Mudhens took a 1-0 lead. 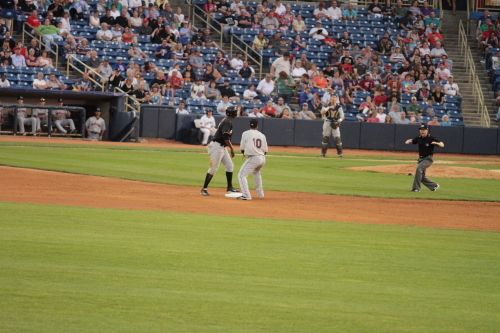 With Worth on second Perez tried to put down a sac bunt. It was a little high. 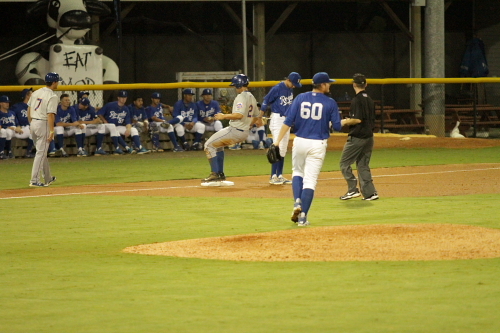 It was caught by Kingham for the first out and was probably one of the worst bunt attempts I have seen. 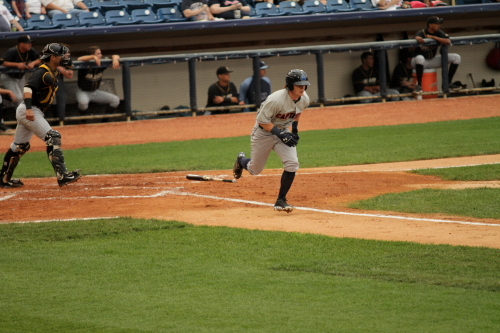 The Mudhens would get a 4th run in the 4th inning a Ben Guez solo home run. 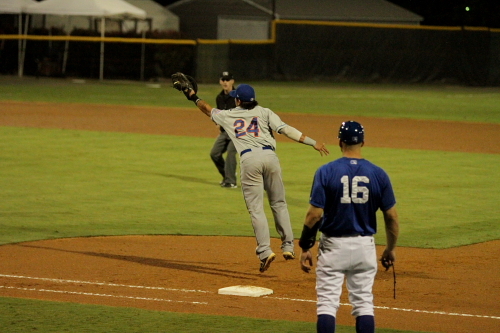 Chase d’Arnaud started the 5th inning off with a double. 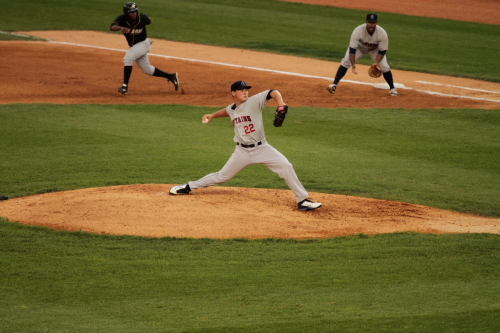 Vin Mazzaro pitched the 7th and 8th inning for the Indians he held the Mudcats off base only giving up a single to Mike Hessman in the 8th but got doubled up to end the inning. Indians starter Nick Kingham pitched 6 innings giving up the 4 runs on 7 hits walking 2 and striking out 4.
d’Arnaud started the 7th off with a triple and was stranded there after all 3 batters after him popped out to infielders. 2 of the 3 were in foul territory. 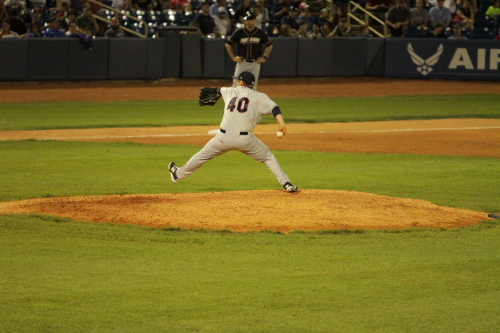 Kevin Whelan pitched for the Mudhens in the 9th. 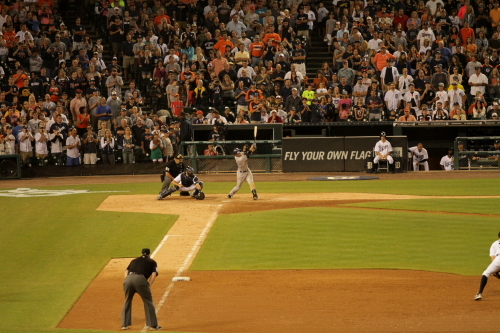 Davis struck out swinging and tried to run on the dropped ball by McCann, but the game ended with the throw to first. 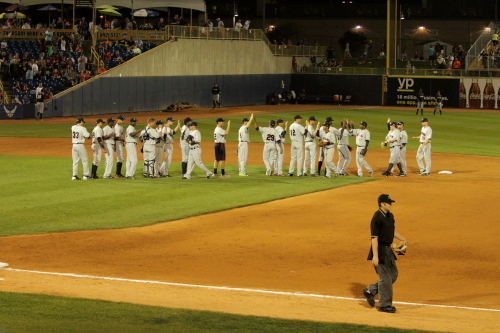 The Mudhens took this one 4-1. the Indians are now 59-59 on the year and the Mudhens are 58-60. 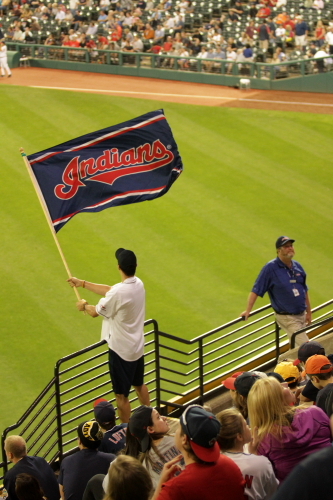 The Indians are in 2nd place in the International League Western Division 3.5 games behind the Columbus Clippers. The Mudhens are 4.4 games back in 3rd place. Since I am writing this the night after the game they are now tied in second 3.5 behind the Clippers because the Mudhens won again against the Indians and both teams are 59-60 for the year. I still possibly have a game or 2 left on this trip depending on if I decide to go to 2 other stadiums in the area both about 2 hours outside of Indy. I will be heading bck to Denver later this week after almost 1 month on the road. 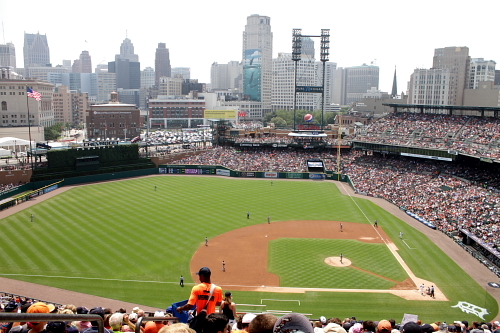 Rockies crumble like an abandon building in Detroit! I did not really get to many photos of the out side of the stadium the first game, so today I got to the stadium slightly earlier to do some of that. I also had to wait for Jared because he had tickets at will call. he was also doing a trip and was in Chicago for 2 games of that series. 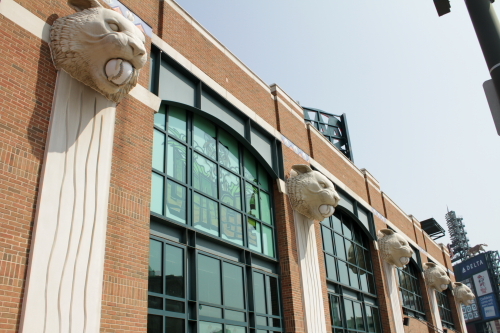 They had these tigers with baseballs in their mouths all around the stadium. 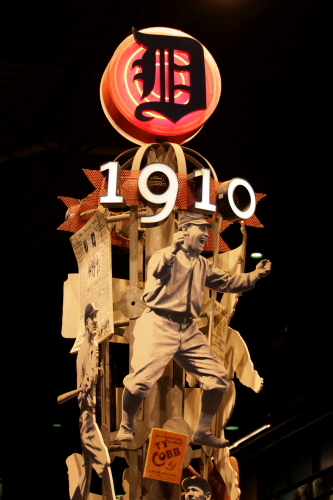 They also had the street light banners like many stadiums do. I was more impressed that this city had street lamps and electricity! 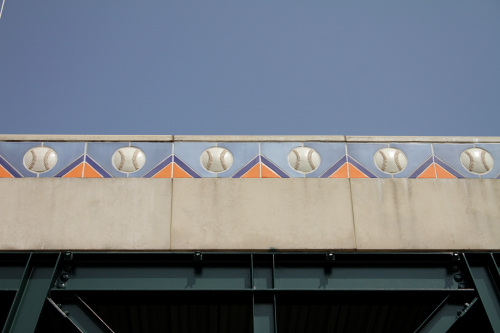 They had some cool details around the stadium like these tile baseballs. These tile logos around an entrance were pretty cool also. 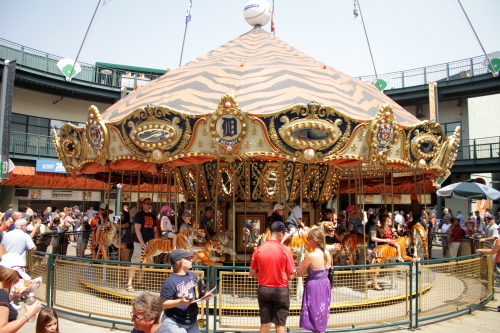 Jared arrive I got my ticket and we headed into the stadium another feature the stadium has is a carousel with all the animals being tigers. 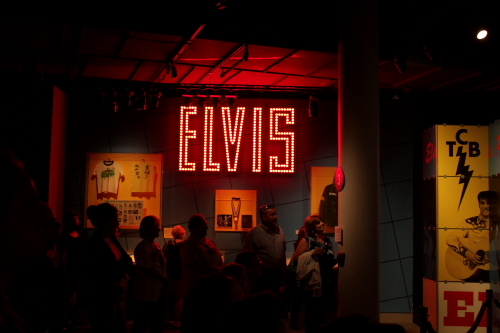 After a few rides on the carousel we headed over by the wall to see if we could get some autographs. I had to pry Jared off the thing after some minor crying and slightly wetting his pants he gave in!!!!!! O.K. that didn’t happen. 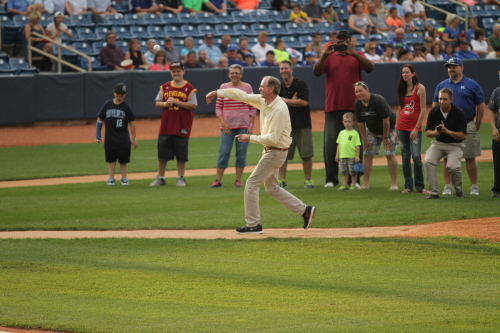 Walt Weiss had a catch with one of his son’s in the dugout. I thought that was pretty cool. I was also a little jealous that these kids get to travel with their parents and do all this including shag baseballs in the outfield during batting practice and just are able to experience these things. 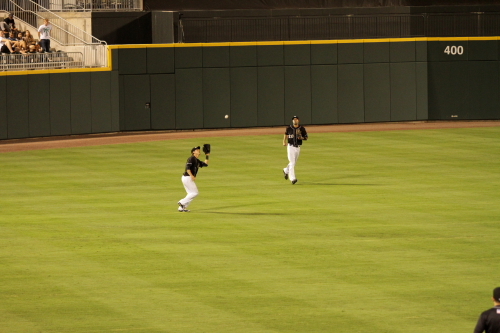 Like playing catch with your dad in a dugout of a major league stadium. 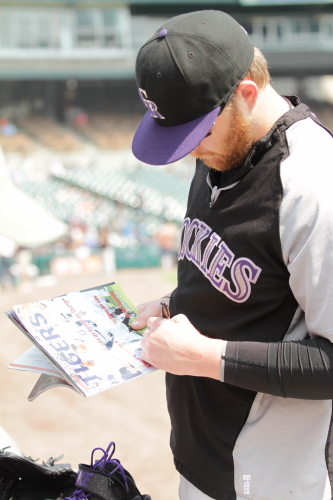 Brett Anderson and Tyler Matzek both stopped and signed after they did their throwing. 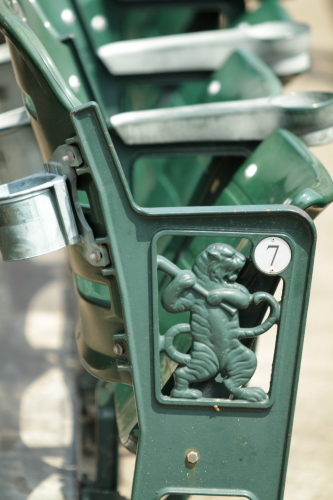 The seats at this stadium had these really cool tigers on the ends. 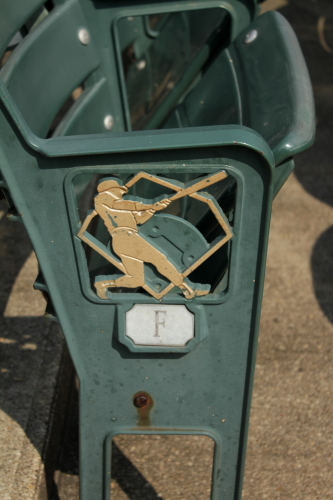 I always think this is a really cool detail that people over look at a lot of the stadiums. 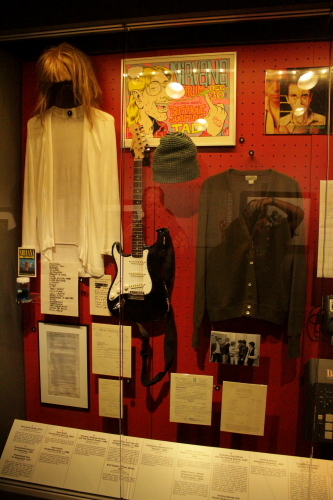 Most do have some really unique stuff. Matt Belilse stands and waits for the colors to leave the field, only one thing there was no color guard today! it is cool that he gives that moment before the games anyway. 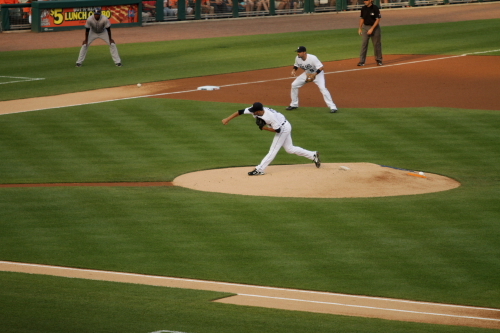 Anibal Sanchez started for the Tigers. 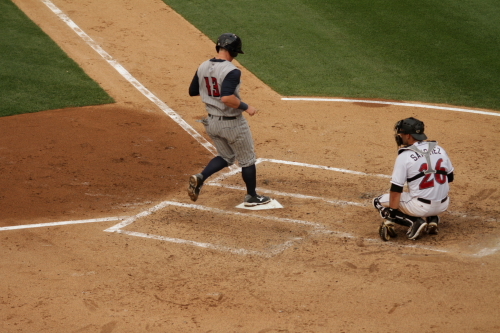 Josh Rutledge makes contact during his 1st. 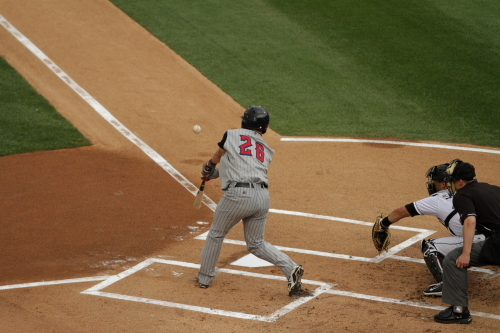 inning at bat. He grounded out to short for the second out of the inning. Jorge De La Rosa started for the Rockies. After the first inning we headed up to our seats. 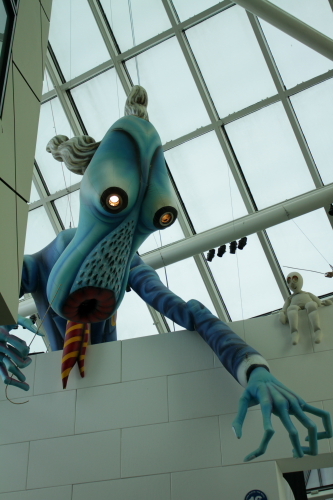 When I got to the upper concourse I took in the sights of the city of Detroit! I know why the stadium the direction it does. Everything in the opposite direction is abandoned and/or crumbling. 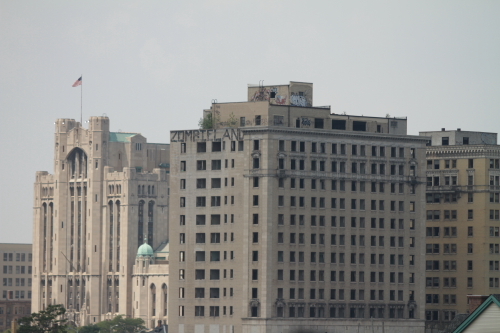 Here is an example of why nobody has said the word “Detroit sure is beautiful this time of year”! The stadium is really nice but it seems like a mirage in the desert of disconcert surrounding area. After those photos it was time to get creative, so here is a creative BNW to show off the made photo skillz! Talking about disconcert back to the Rockies game! 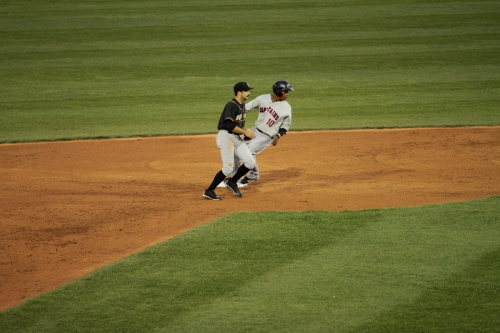 Tori Hunter grounded out to start off the 2nd for the Tigers. Here is a look at downtown from the upper deck. 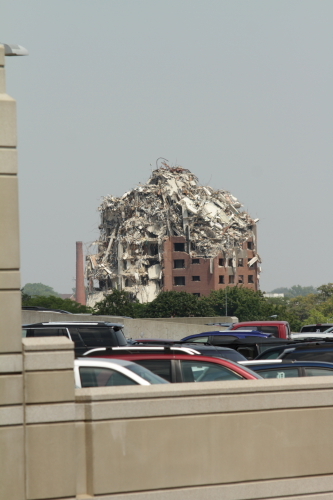 You can’t tell that everything in the other direction is almost ready to be demolished. 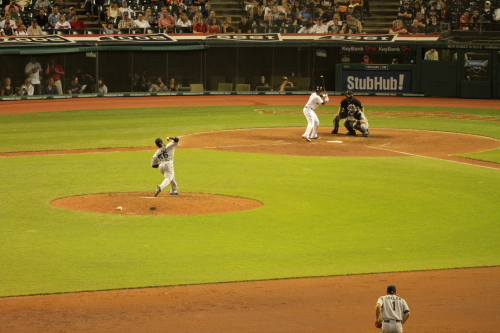 Jorge Pitching to J.D. Matinez in the 2nd. The Rockies did not do much in the top of the 3rd. they did manage to get their first hit a single by Brandon Barnes. 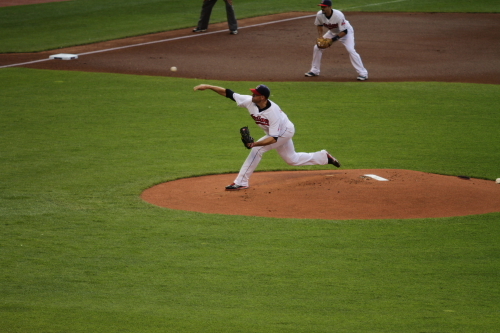 Jorge did get the first 2 batters out in the bottom of the 3rd. 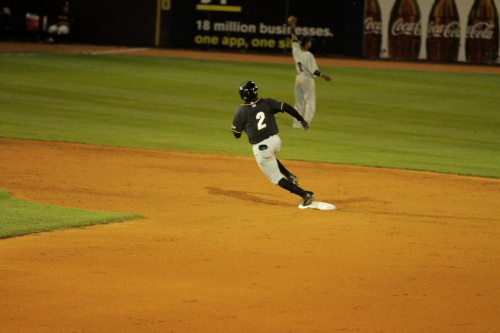 and then the Rally began, Rahj Davis started off with a double. 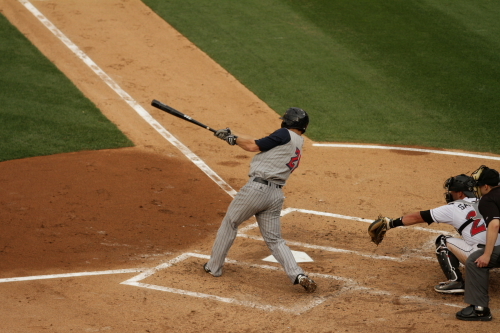 Ian Kinsler was than hit by a pitch. 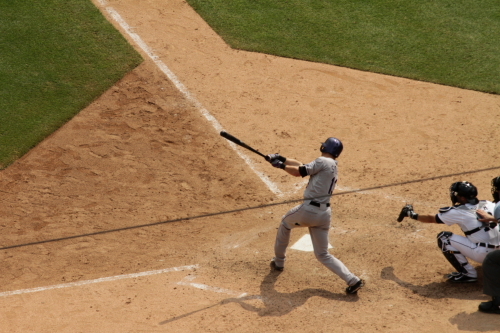 Miguel Cabrera hit a single that scored Davis and the Tigers took a 1-0 lead. 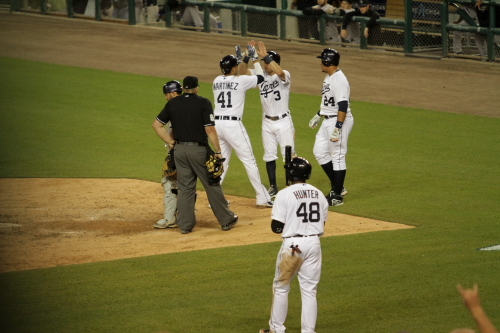 Victor Martinez hit a 3 run homer. 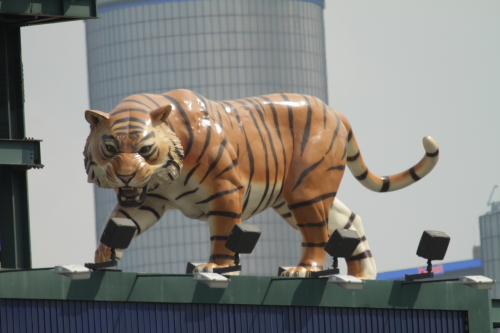 This gave the Tigers a 4-0 lead. 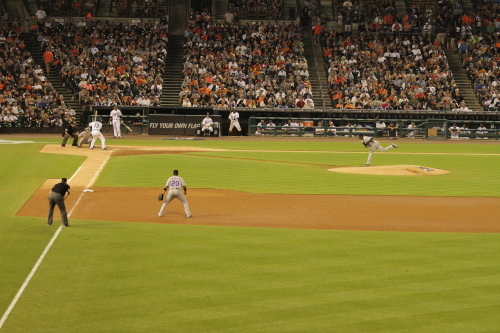 Jorge did strike out Hunter for the 3rd. 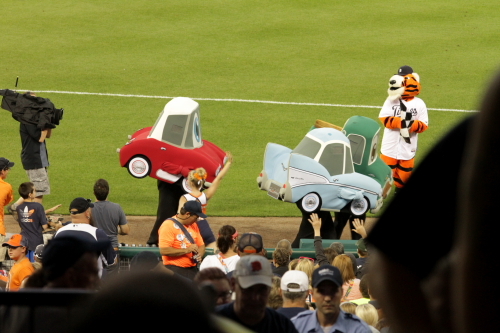 out of the inning and it was time for the Chevy race which is way cooler and not as creepy as the random dental product race at Coors. Not much happened in this game till the 7th. when Jorge was taken out of the game by Walt Weiss. 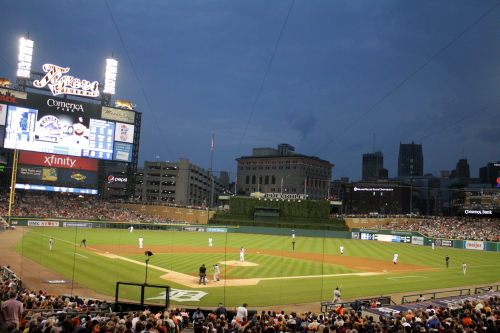 The Tigers did get 2 hits in the 5th but no runs came from it. the Rockies only had the 1 hit till Drew Stubbs hit a single in the 7th. 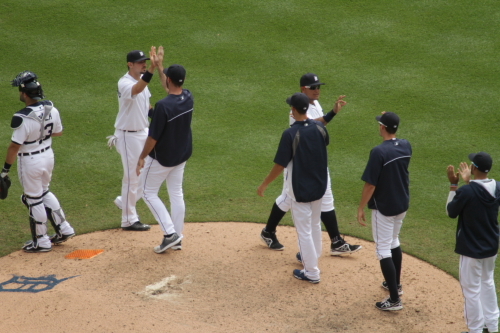 Jorge went 6.2 innings and really did not pitch that bad he did strike out 6 and gave up the 4 runs in the 3rd. The 1 walk he allowed did hurt him with the Martinez home run but the 3rd run did not really matter. 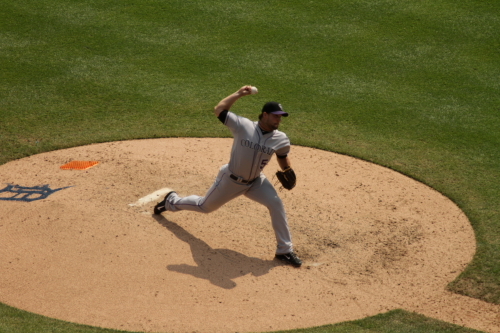 Tommy Kahnle came into pitch for the Rockies. 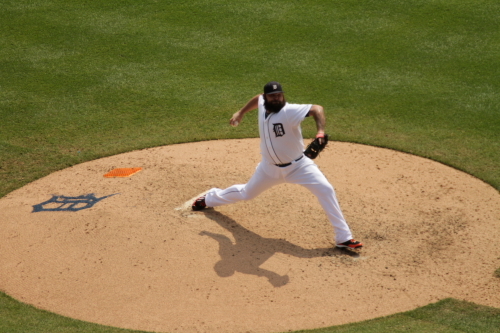 Joba Chamberlain came in to pitch for the Tigers in the 8th. 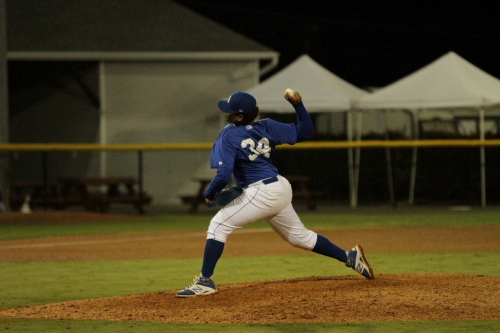 Sanchez pitched 7 complete innings only giving up 2 hits striking out 12 batters. 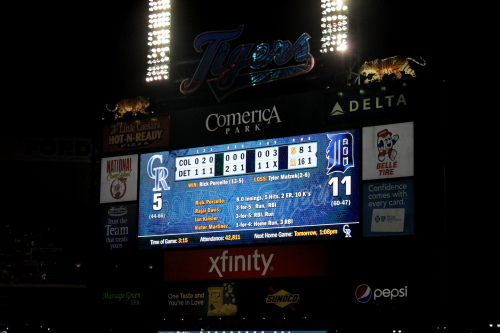 The Tigers above the score board was as fear looking as Sanchez’s pitching! Thought these were pretty cool. Adam Ottavino pitched the 8th inning for the Rockies. 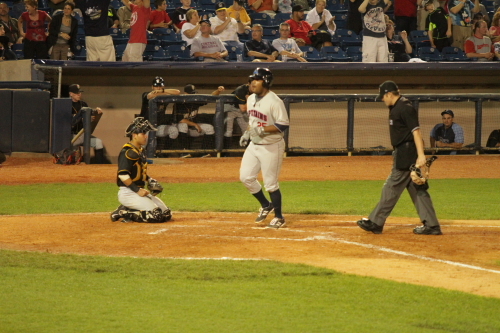 Drew Stubbs hit the ball to center for the last out of the game. 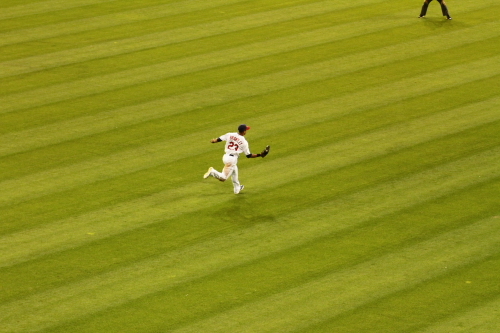 Rahj Davis makes the catch and the Tigers win this game and swept the Rockies. 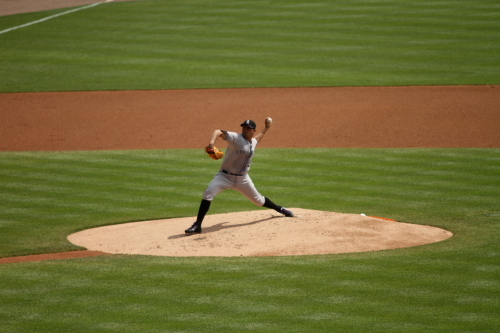 The start by Jorge was not to bad, the 3rd inning was his only bad inning. He did have runners on in most innings but worked his way out of it. The pitching did keep the Rockies in the game but there was absolutely no bats against Sanchez. 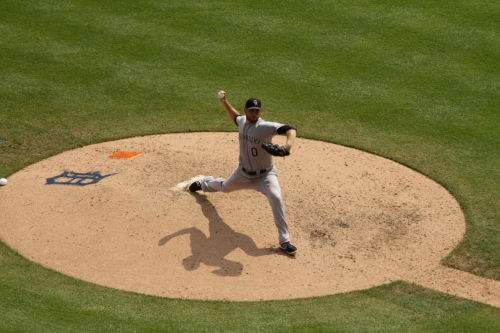 The Rockies scrapped out 4 hits only 2 off Sanchez and 1 of each of the Tigers relievers. So that is it from Detroit I have made the turn back west and still have a few games left before going back to Denver 1 in Indianapolis and 2 others. My 1st. game of the series. This was my first time at this stadium so I arrived a slight bit early to take a walk around the stadium and check it out. I also got there early because I was not sure what the lines woud be like because they were giving away Pudge Rodriguez Figurines or Statues ( Did not take mine out of the box yet). 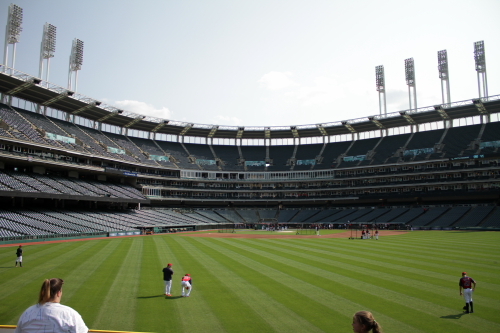 I headed in for batting practice and I started out in right field and then went to left. The gate I entered was close to right field and Corey Dickerson and Charlie Blackmon were in the first group so I like my chances to get a baseball. I did not get one in that group and figured that most of the rest of the batters were righties and headed to left. Had a few close but still did not get a ball. So got shut out in BP. 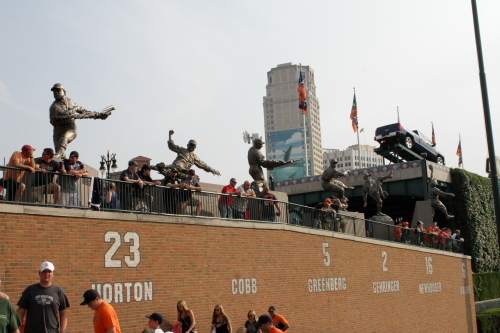 Then I wandered the concourse a little these are statues they have in left field I took this photo from the seats because you really can’t get a good photo from the concourse because they are facing the field and there is not much room between the fence and their base’s. 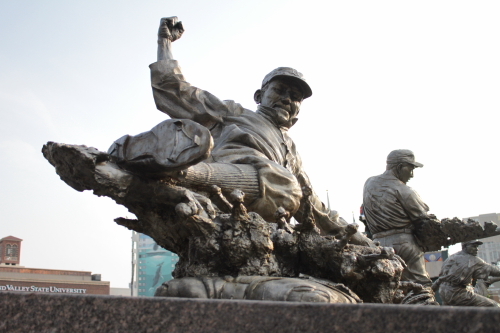 This is a photo I got of the Ty Cobb statue. 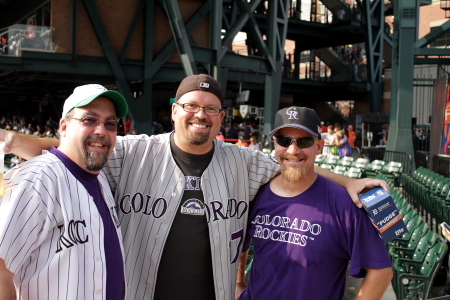 While I was on the concourse I ran into Dan from Coors Field and Mark who is from Charlotte they meet up for a away series and I have actually ran into them in N.Y. a few years ago. Mark Left, Dan Middle, Me right! 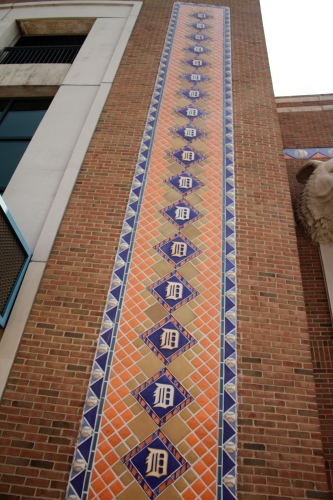 Around the concourse they had these columns that had different years through out the years of Tigers history. This from 1990’s. These are 2 more 1 from the 1980’s and the second from 1910. 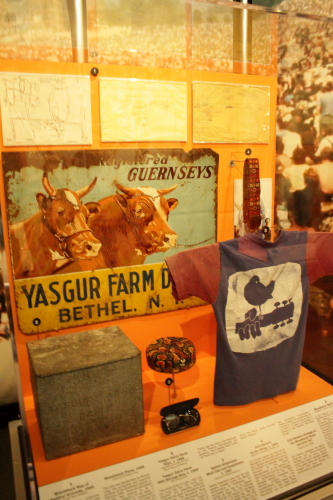 These were all about 25 feet tall and had different years on each side. 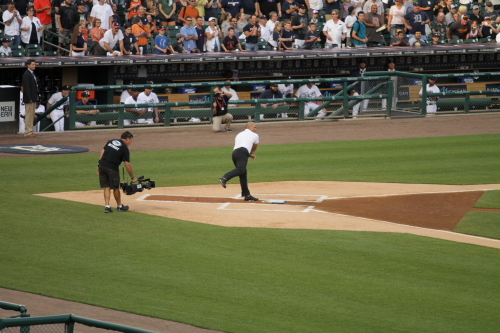 Pudge Rodriguez threw out the “First Pitch” or as he did throw to second. He started on the mound and then had Anibal Sanchez who was catching him go to second base and he went to home and tossed over to second. Fitting since he was a catcher! 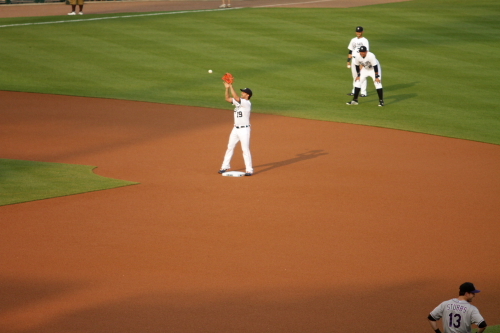 Anibal Sanchez at second to make the catch from Pudge. 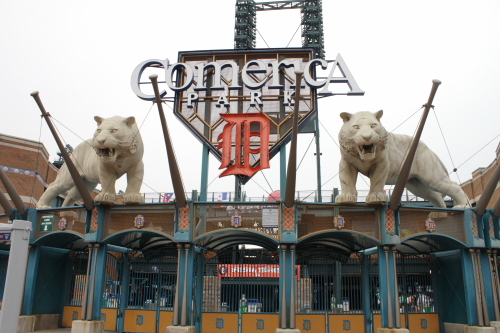 Rick Porcello was the starting pitcher for the Tigers or as the were called today Los Tigres, it was Latin American day at Comerica. 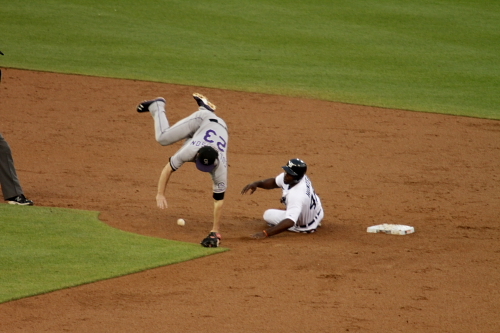 After Getting the first 2 Rockies out Corey Dickerson reached base on an error by Ian Kinsler at second base. After reaching second when Nolan Arenado walked he got caught stealing third to end the inning. Tyler Matzek started for the Rockies. He did not start by getting 2 outs he started the game giving up a double to Rahj Davis. 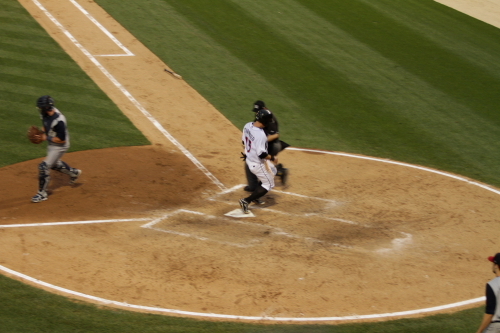 Davis scored when Miguel Cabrera hit into a double play. That gave the Tigers a 1-0 lead. The Rockies got on the board in the second inning and gave Matzek some run support. 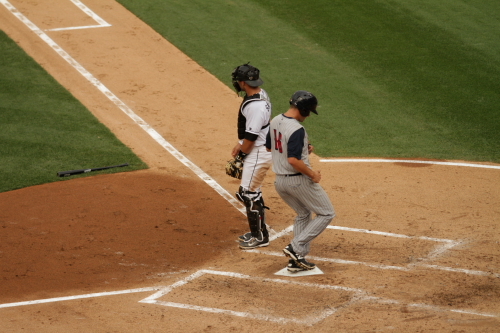 Their first run was a Justin Morneau, he scored on a Drew Stubbs double to tie the game. 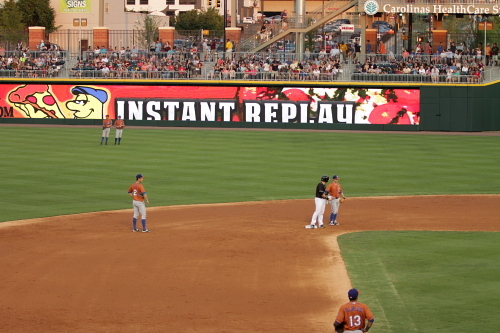 Drew Stubbs scored on a Charlie Culberson ground out to give the Rockies a 2-1 lead. 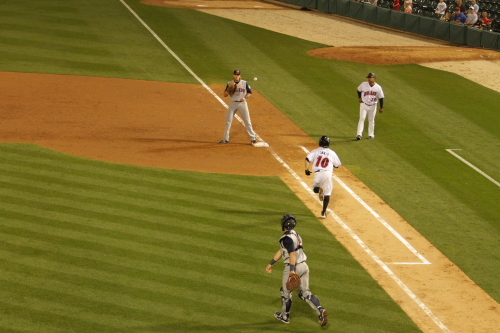 Tori Hunter walked to start off the 2nd inning and on a ball hit by J.D. 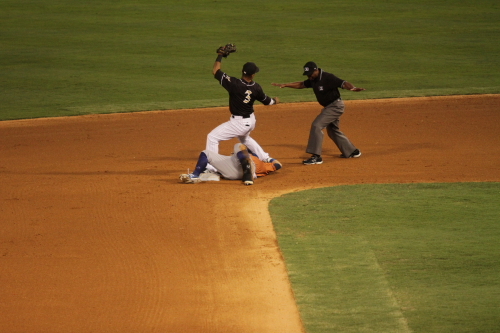 Martinez Arenado made a great play, throwing from 1 knee to get Hunter at 2nd. 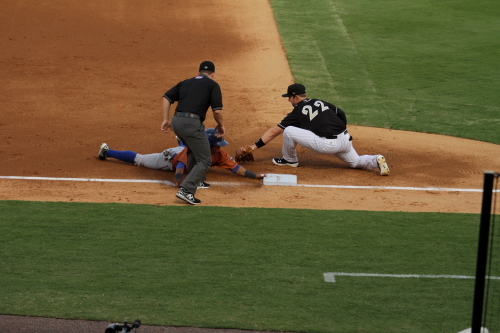 Hunter came in just a bit hard into second and sent Culberson flying to break up the double play. 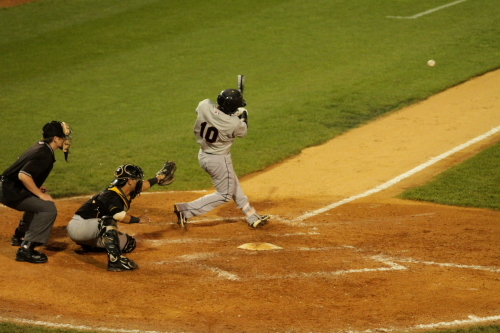 The tigers went on to score their second run to tie the game at 2 in the second. J.D. 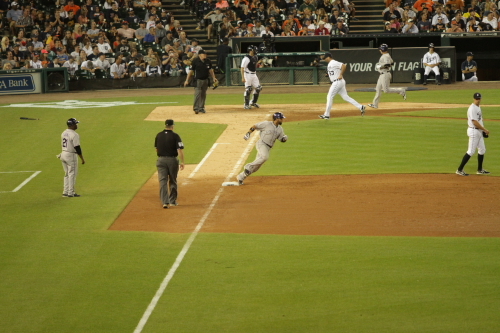 Martinez score on a Alex Avila single. 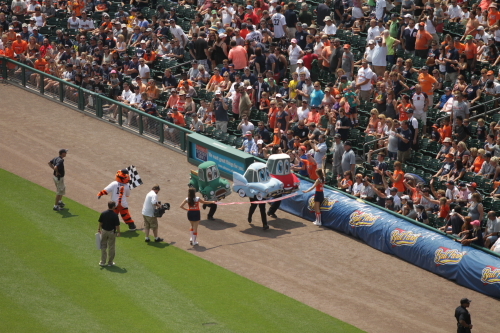 They also have a race here in Detroit and this one is sponsored by Chevy It is 3 cars that run from center field to around first base. It is a lot better then the random dental products race at Coors and the characters are not as creepy! The Bella Air after the Classic Chevy car, Petey Pick-up and Corey Vette. 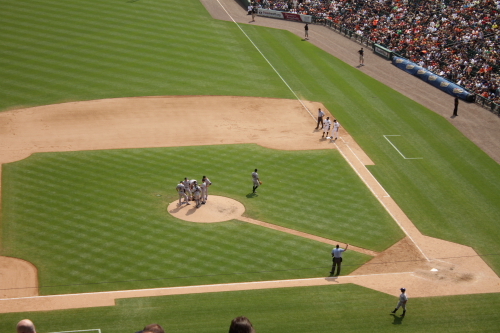 The Rockies did not do anything in the 3rd and the tigers scored 1 on a Cabrera solo home run to center. That home run tied him for 6th place with Lou Whitaker on the all time Tigers list with 244 home runs. 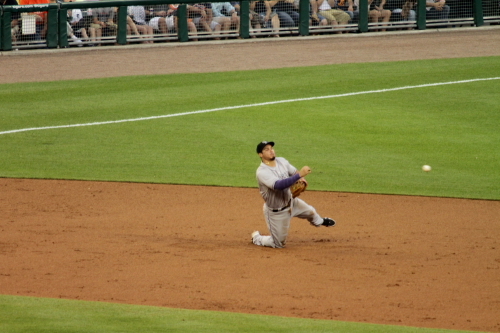 Drew Stubbs Hit a triple with one out in the 4th for the Rockies and was left on base after Wilin Rosario and Mike McKenry both struck out. They were both in the game because of the DH in an American League park. 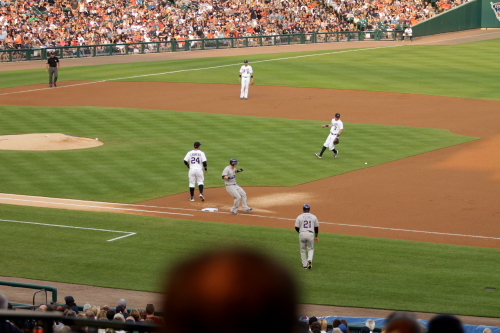 Rosario was actually at 1st and Morneau was the DH this game. 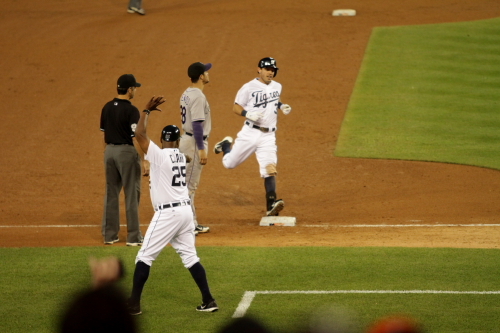 The tigers extended their lead in the 4th by another 2 runs to give them a 5-2 lead. 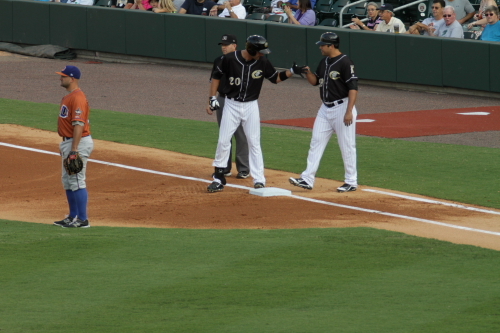 Nick Catellanos hit a triple with 2 outs and Avila hit a double and on a Eugenio Suarez single. 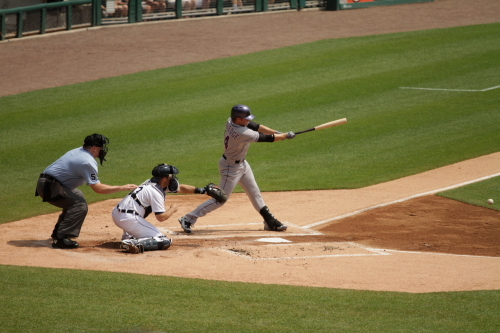 The Scoring continued in the 5h for the Tigers when Kinsler started the inning with a triple. The Rockies walked Cabrera and Victor Martinez showed them why that was a bad idea, he hit a home run and gave the Tigers 3 more runs for a 8-2 lead. No if Cabrera hit a homer it would have been on 2 more runs (sarcasm). 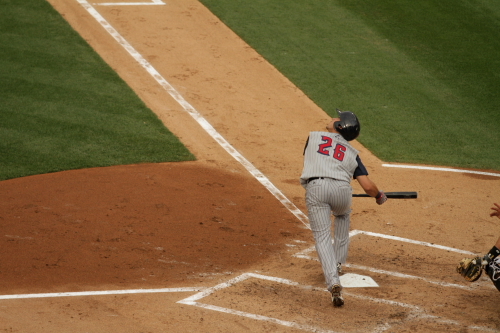 But in reality the odds of a second homer in consecutive at bats is kinda slim even with a guy like Cabrera. 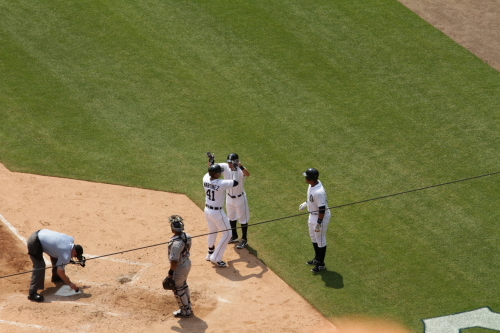 V. Martinez celebrating with the 2 runners he hit in after his stroll around the base’s. 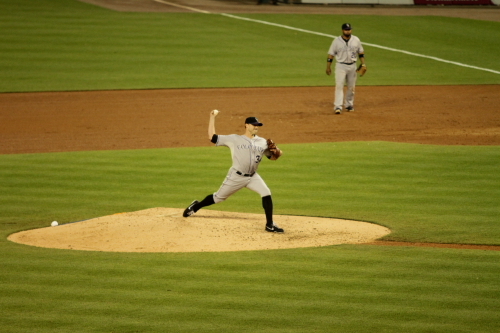 Matt Belilse came into pitch for the Rockies in the 5th to try and stop the bleeding or add salt to the wound. See it how you wish! Matzek pitched 4 innings giving up 10 hits, 8 runs striking out, walking and giving up 2 home runs. I was a little nervous when they brought him up and he started out well in his debut, since he has turned into another Rockies starter that struggles and doesn’t get run support to make it easier ion him. I think some of these guys pitch slightly better when there is a little cushion in the run department. So back to Belilse and the salt in the wounds! He did get the next 2 batters out in the 5th. 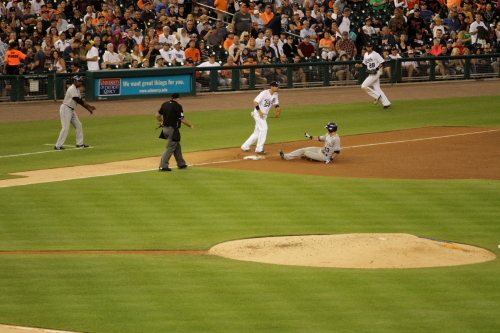 In the 6th he did give up the 9th run of the game for the Tigers. 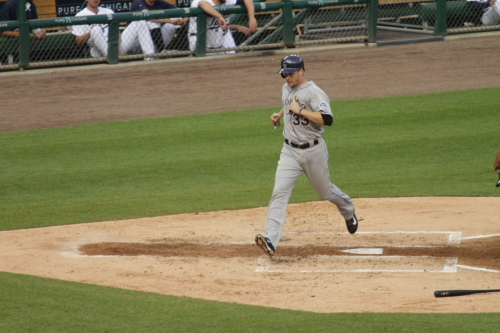 Rex brothers came in to pitch the 7th for the Rockies and well he gave up a run also a homer to the J.D. Martinez for the 10th run in the game and a run in the first 7 innings. LaTroy Hawkins got in on in the 8th and could not be left out of the runs scored against the Colorado pitchers and gave up one in the 8th for the 11th run for the Tigers and yeas a run in every inning they have come to bat. A bit more on that in a minute. The Rockies tried for a valiant come back in the 9th Arenado started the inning with a walk Brandon Barnes hit a double followed by a drew Stubbs single to score Arenado and cut the lead to only 8 runs 11-3 tigers. 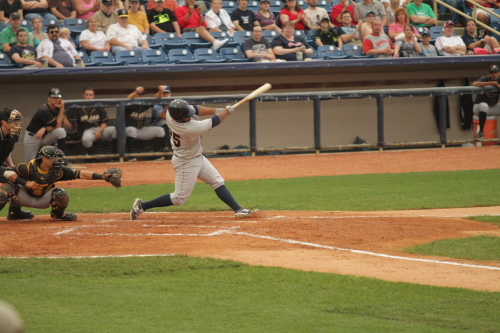 Wilin Rosario would then hit a double scouring Barnes cutting the lead to 7!!!! 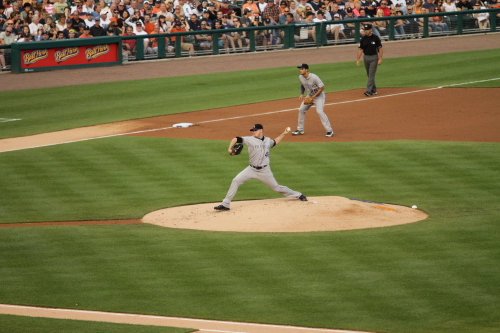 The Rally then fell apart after the Tigers removed Phil Coke from the game and replaced him with Pat McCoy who got the next 3 batters out and ended the game with a 11-4 win for the Tigers. 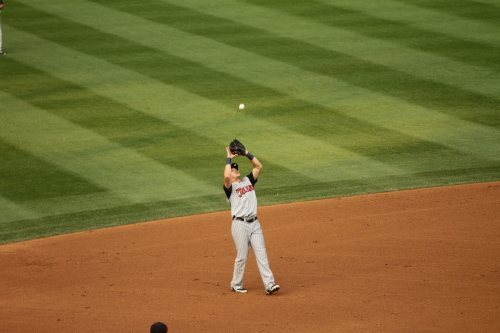 Josh Rutledge made the final out by striking out swinging. 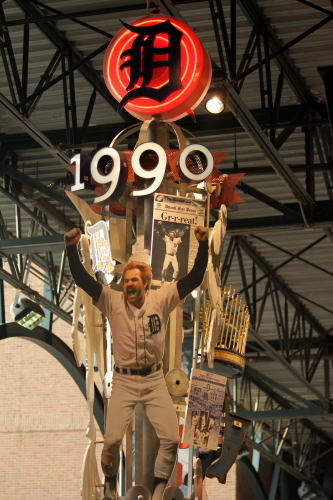 So the 8 runs in all 8 innings was the first time the Tigers since 1912. The Rockies once again making history for other teams one game at a time! This was also the first time it was done since 2006 when the Yankees did it against the blue Jays. it was also only the 5th time in the last 35 years that it has been done in the Majors. The Rockies have actually done it twice. here is a look at the final line of this game with the 8 scoring innings by the Tigers. Don’t See This Every Day! That is it for this game in Detroit have another coming up from Sundays game! 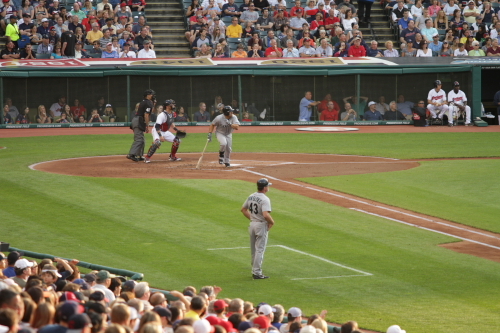 Mariners Indians in Cleveland. Can’t come up with a clever title in Clevland! I first went to the stadium in the morning to get a ticket for the game and took a quick walk around the stadium. 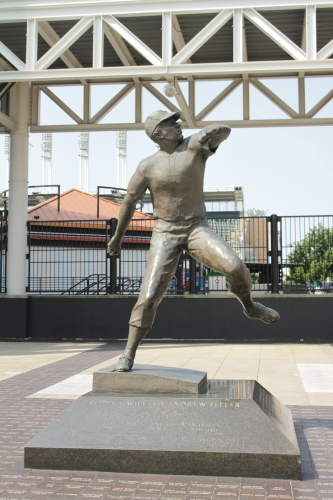 This is a Bob feller statue that is outside the C gate which is in left center field. It is also the early gate for batting practice. 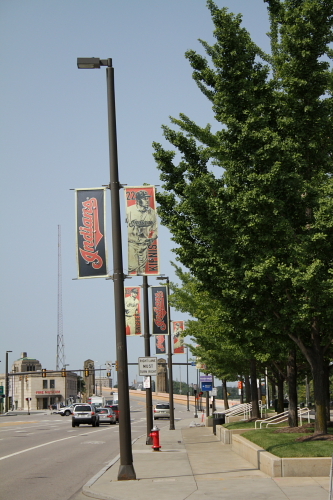 around the stadium on the light posts they have banners with current players names on them. Yes, Justin Masterson’s was still up! 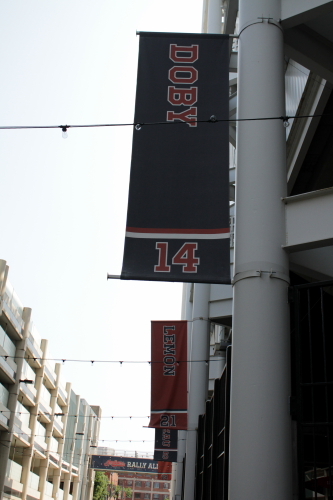 Down Rally Alley which is outside the stadium on the third base side they have banners of their hall of Famers. The early ticket window is located by gate A and I got my ticket. 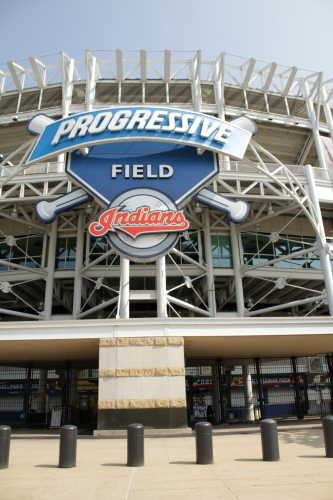 One thing that I did not like is they have flex pricing like many stadiums so the digital sign said one price and then at the ticket window the price was different and when I asked the attendant just said well they just did not change the prices for todays game yet. I don’t like flex pricing in the first place but not to have the correct prices up is kind of stupid and deceiving. After getting my tickets I did a little urban hiking and took some photos. 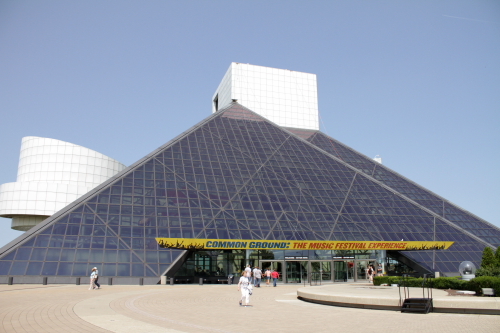 One of the first places I saw was the Rock n’ Roll Hall of Fame I did not go on the tour but I did go in. I am planning on going after I finish this post today! 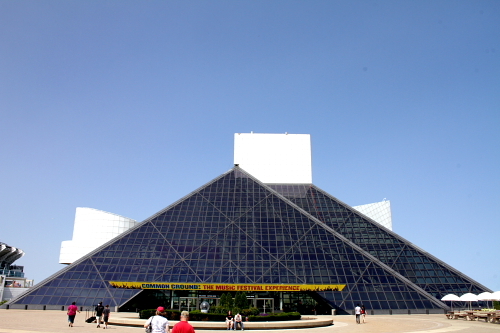 By the Rn’R HOF I also saw the stadium where the Browns play. 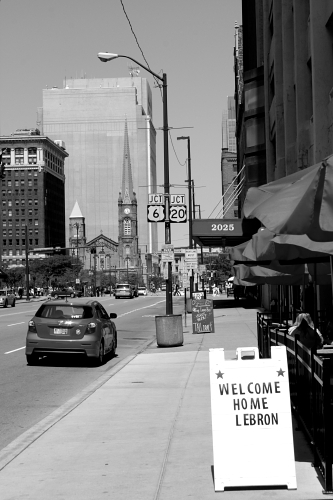 After that I walked around the city and took some photos. 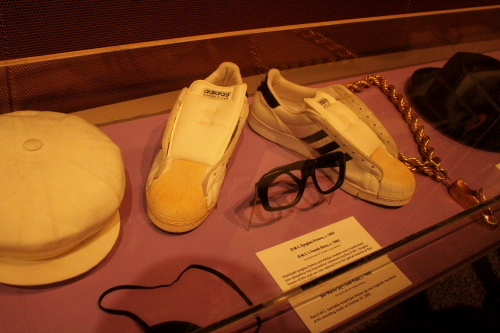 Lebron was a big theme around the city, as seen in this photo. While walking I took some street photos and photos of Monuments and Building in the city. I would post more but this post would be a lot bigger then it already is! 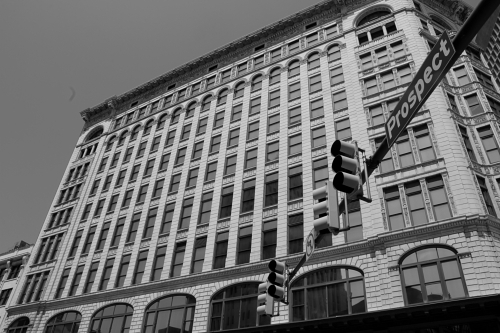 But Cleveland has a lot of history and some really cool buildings. I also took a walk threw the cemetery directly across the street from Progressive field which had a lot of very old graves going back 120 years. After walking around I headed back to the hotel before heading back out for the game. Then I got to the gate a little after 4 for the 4:30 gate. 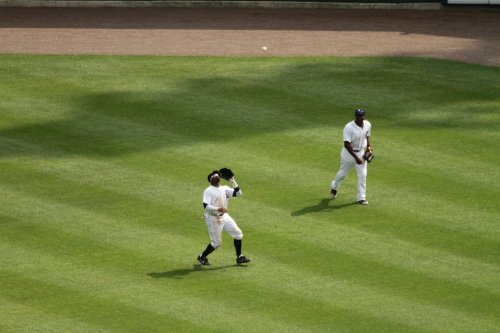 here is a look during Batting Practice. I did well this BP and got 2 baseballs the first was a catch from the Indians the first that was hit out for the day. To pat myself on the back it was a pretty good catch that I ran down an aisle and caught it about a section over from where I was standing. 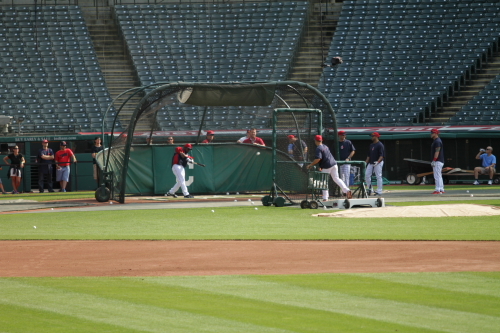 Indians player taking swings in the cage. 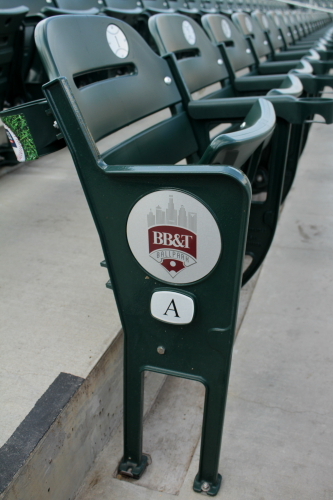 Here is what the side of the seats look like on the end of an aisle. 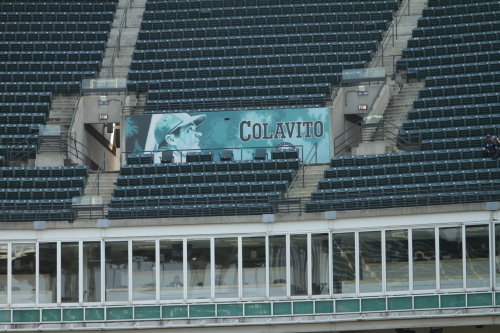 Around the upper deck they have murals for their Hall of Famers, The one show is for Rocky Colavito. 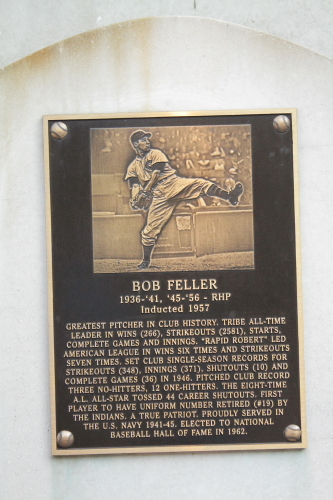 They also have Bob Feller, Larry Doby and Early Wynn. 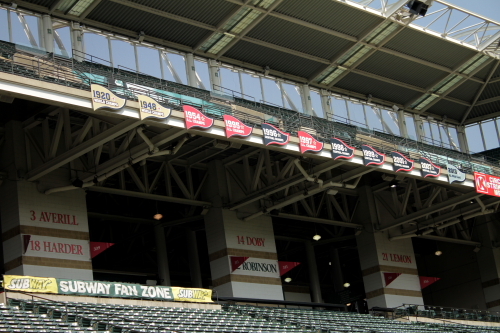 They also had these “banners” up with all the team accomplishments in their history. Including last years A.L. wild card. during BP I also got a second ball from the Mariners it was just a pick up but a second ball. It I the first time I have gotten 2 ball in one MLB stadium on the road. I have gotten 2 at other stadiums but not in the same game. 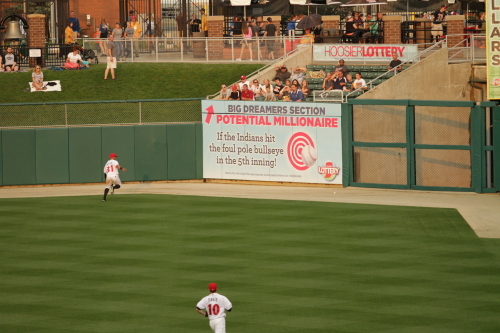 In center field they have Indians heritage Park. 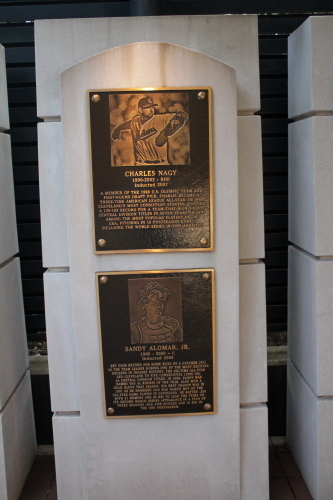 They have plaques of Hall of Famers and other players that played for them through out their history. 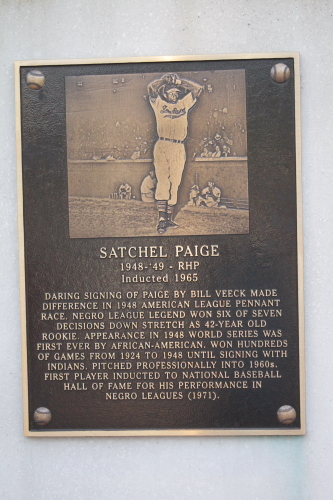 Here are a sample of the plaques these are satchel Paige’s and Bob Fellers. I then took a walk around the stadium. 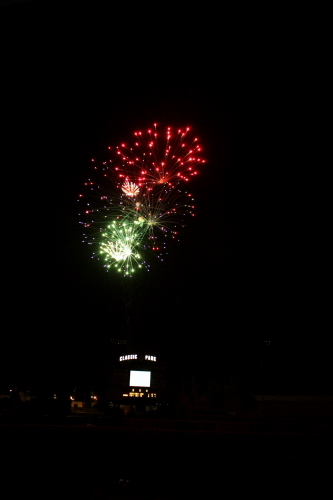 I headed up to the upper deck and got this photos. 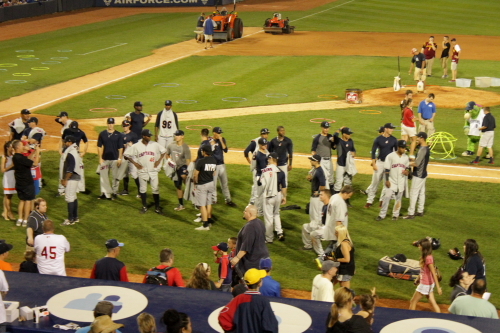 I then headed down to the Mariners side of the field for autographs. I was trying to get a Robinson Cano locker plate signed but was not successful on 1 player and 1 coach signed. 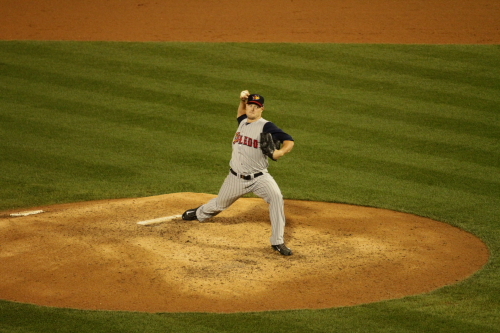 Zach Mcalister started for the Indians. He allowed 1 hit to the Mariners Chris Taylor but got out of the inning on a double play hit by Robinson Cano. 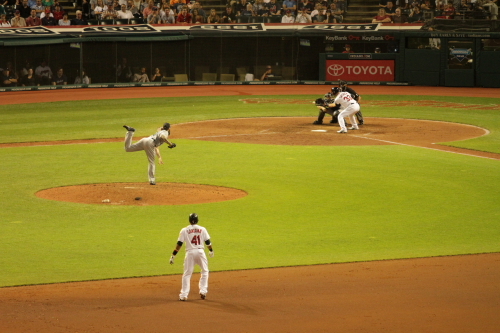 Indians first baseman Carlos Santana making the play for the first out of the inning a Dustin Ackley hit to second. 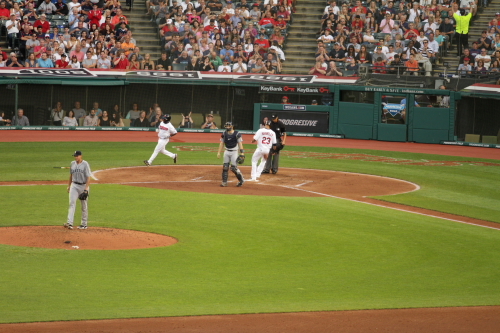 Chris Taylor hit a ball to the Indians third baseman Lonnie Chisenhall. 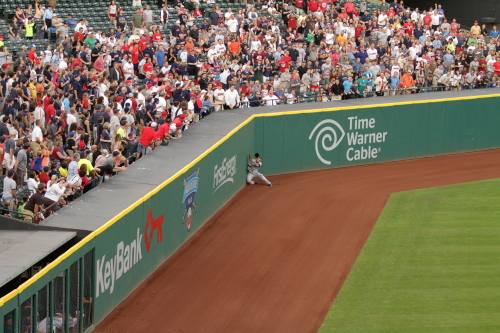 The ball bounce off of Chisenhall and Taylor go on first. 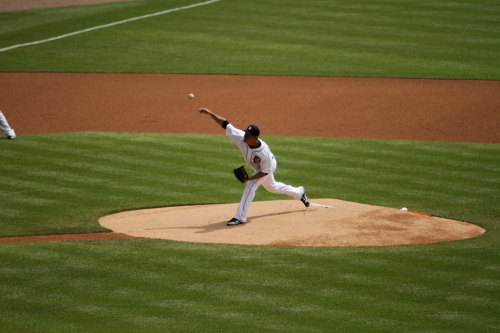 Chris Young started for the Mariners. Jason Kipnis hit a double. 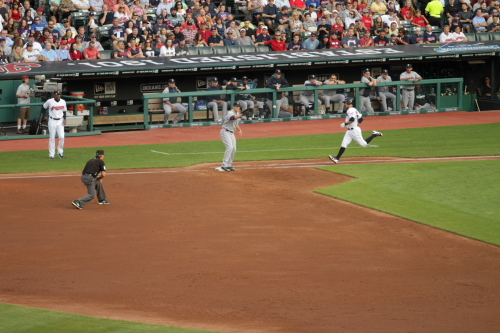 He would advance to third on a Jose Ramirez sac bunt. 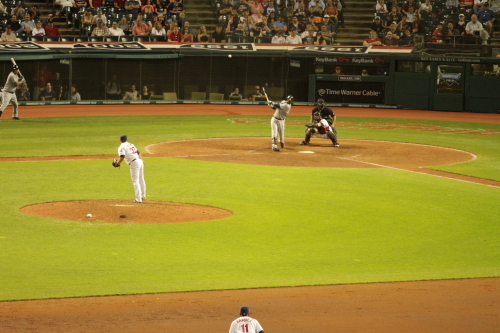 Kipnis than scored on a Michael Brantley single and the Indians took a 1-0 lead. After the first inning I started heading to the left field bleachers the long way. Because the concourse on the main level is open longer on the 1st base side then the 3rd base side which could would have been shorter. 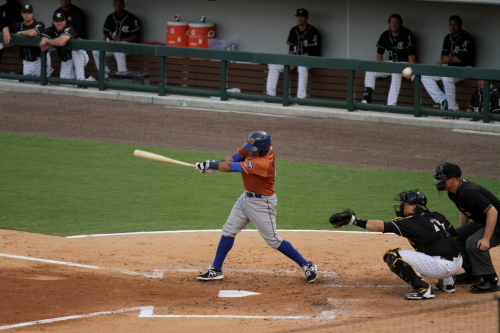 The Mariner Kendreys Morales lead the inning off with a double to left field. 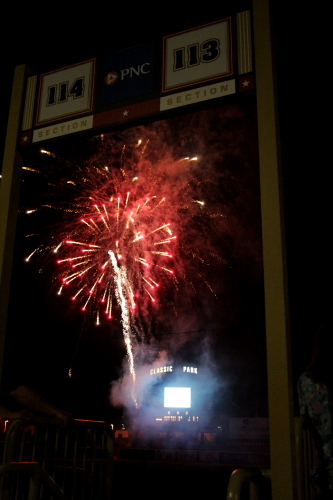 I got to my seat in the left field bleachers in the middle of the second inning. 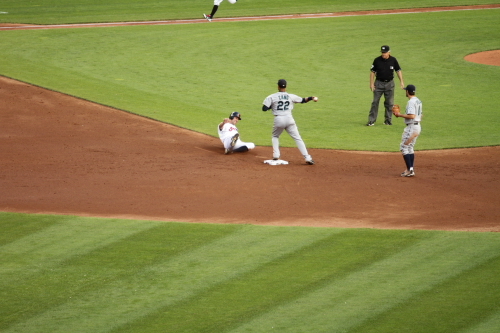 Morales would score on a Logan Morrison sac fly and the Mariners tied the game at 1. 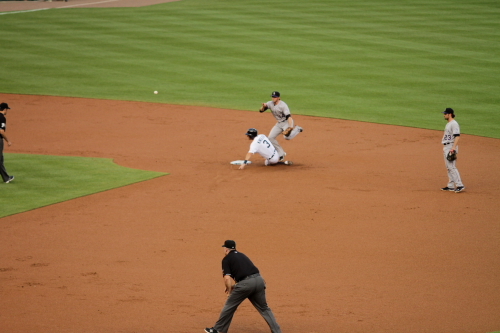 Cano turning a double play to end the bottom of the second inning. 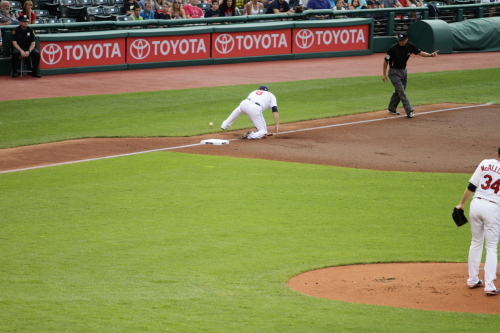 Yan Gomes was out at first on the double play. 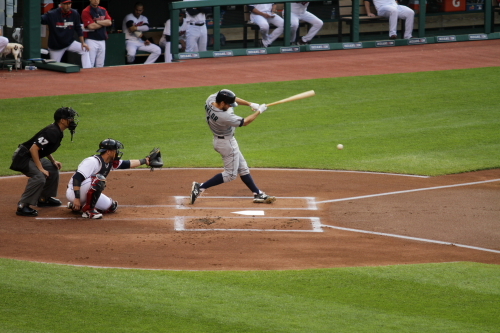 Dustin Ackley hit a 2 run home run to give the Mariners a 3-1 lead in the 3rd inning. 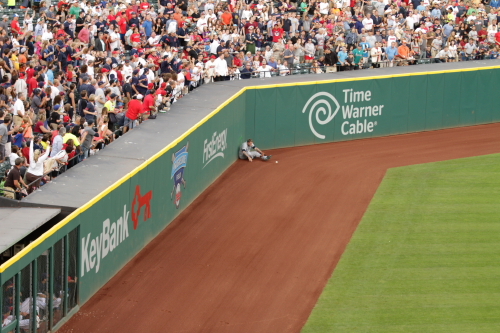 Corey Hart hit the wall pretty hard on a Michael Brantley hit that lead to Brantley getting on third. 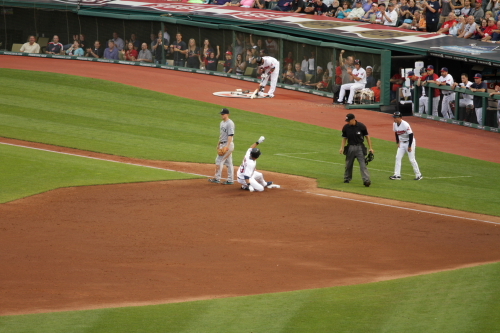 Brantley sliding into third. 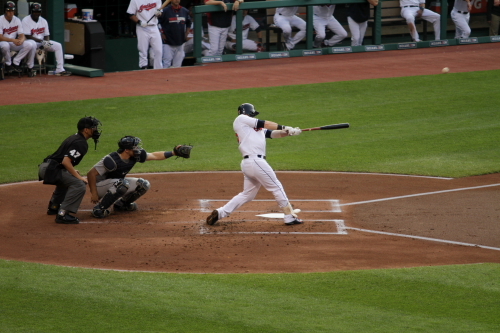 Earlier in the inning the Indians did tie the game at 3 on a Jason Kipnis 2 run home run. 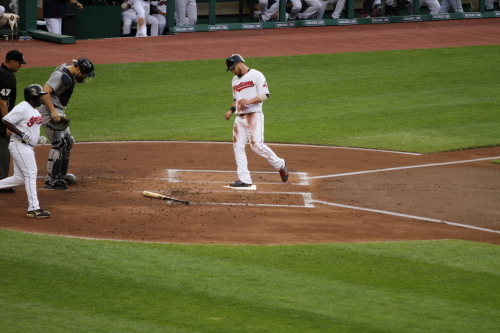 Brantley scored on a Carlos Santana sac fly to Hart in right field and the Indians would take a 4-3 lead. 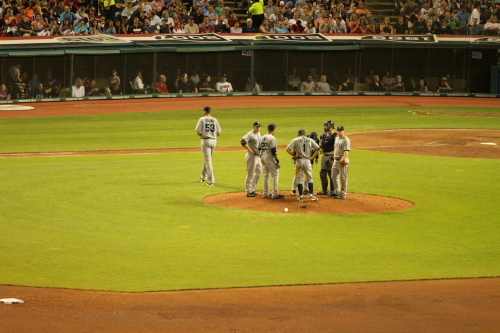 The Mariners took started Chris Young out of the game in the 5th inning. He 4 runs on 7 hits struck out 2 and walked 1 batter. 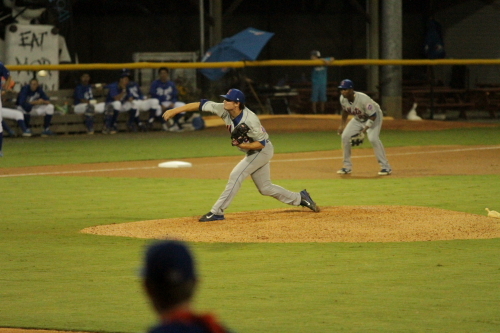 Dominic Leone came into pitch for them. 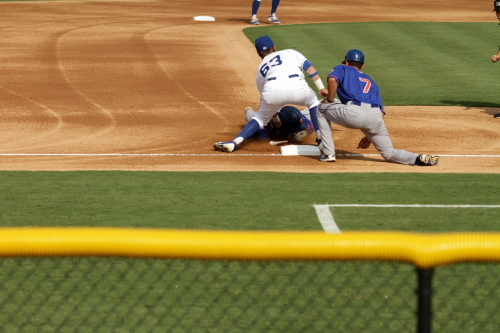 Chris Taylor makes a diving play in the 6th inning on a David Murphy hit. 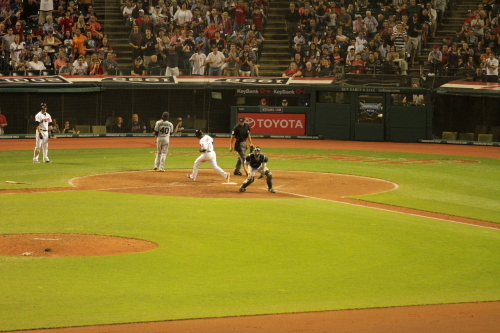 The Indians extended the lead by t 2 scoring their 5th run of the game in the 7th inning. 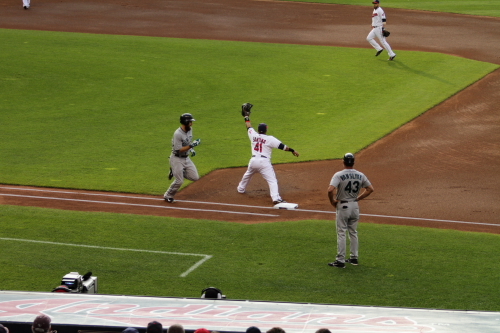 Ramirez scored on a Santana single. 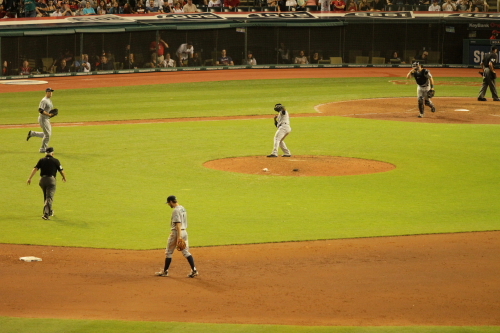 Ex-Rockie Joe Beimel came into pitch for the Mariners in the 7th. 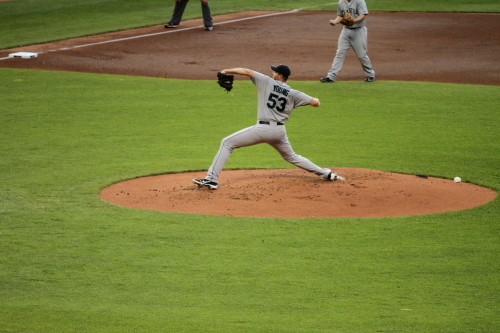 Beimel was the 5the pitcher of the game for the Mariners. Mike Zunino hit a 2 run homer to give the Mariners a 6-5 lead in the 8th inning. 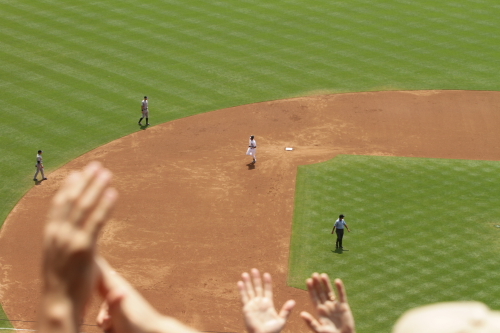 He high fives his teammates after his homer. 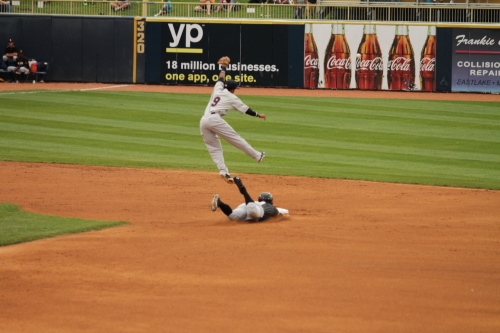 Lonnie Chisenhall diving to try and get the third out of the 9th inning. he came up a little short. 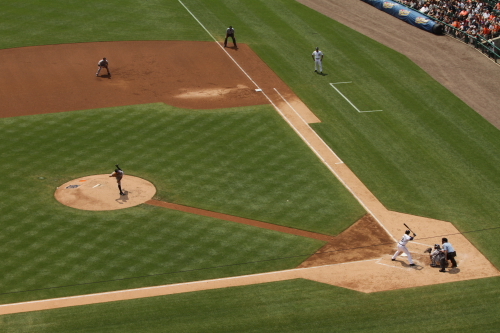 The inning would end a few pitches later when Cano flew out to center. 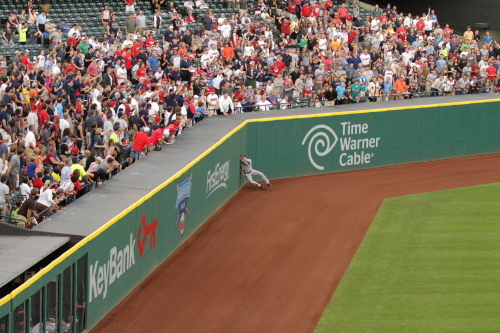 Michael Brantley makes the catch. The Indians needed a rally in the bottom of the 9th to win this game. Fernando Rodney the 7th pitcher of the game for the Mariners and the 14th used by both teams. Rodney got the save and shot the arrow! 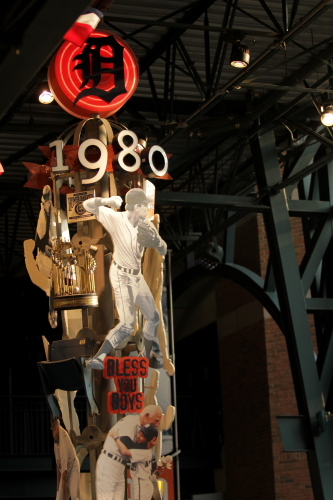 The Mariners won this on 6-5. 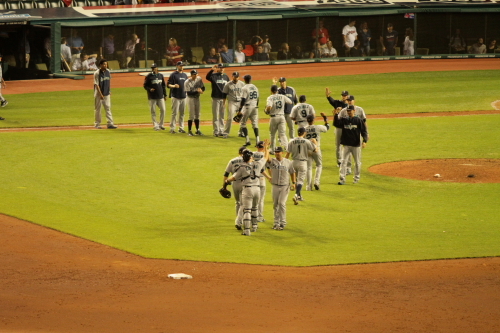 The Mariners celebrate their win against the Indians. This was a pretty good game beside the tremendous amount of pitching changes. Overall this was not that bad of a stadium not quite the best but wouldn’t call it the worst. It did seem hard to get around at times but once I figured out it was not that bad and BP was not overly crowded till about half way into the Mariners batting practice. 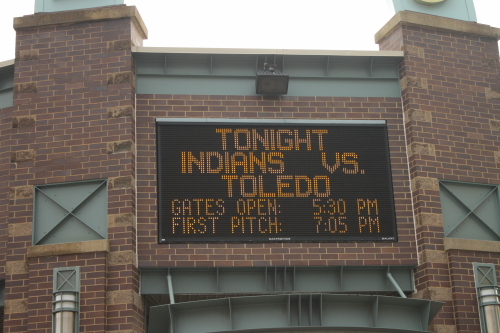 The early gate is at 4:30 for a 7 P.M. game and the rest of the gates open at various times. So that is it for this game and stadium next up is Lake County for some advance a ball then onto Detroit where I get to see the Rockies again for the first time in 3 weeks! 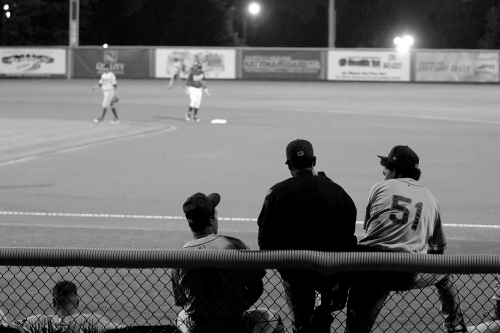 I think I have been seeing better baseball on the road so don’t feel like I have not missed too much with them. The Knights gets some runs on the Bulls. 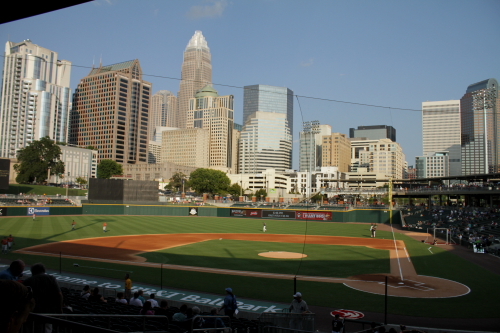 BB&T Ball Park Charlotte, N.C. 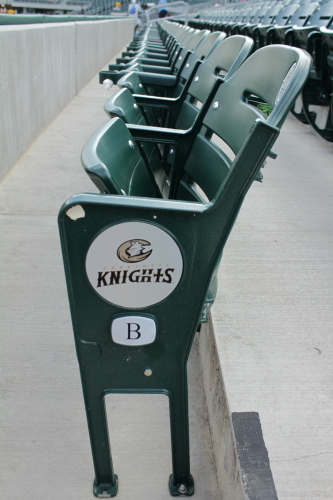 The Knights are the triple A affiliate of the Chicago White Sox and the Bulls are the affiliate of the Tampa Bay Rays. This was the first game I attended at this stadium, but it is not the first time I have seen it. 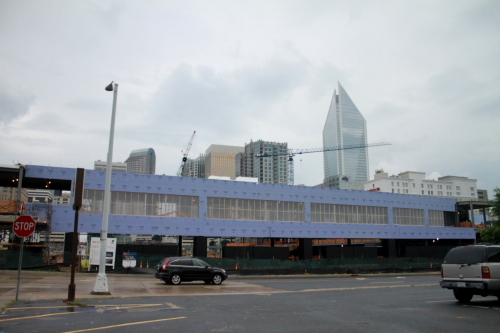 I have actually seen this stadium being built-in various stages in 2012 I was in Charlotte the day they set the plate and broke down and last year I was there just about halfway through the construction. 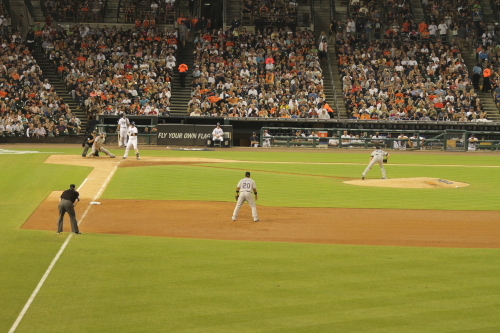 The above photo is behind home plate and is not an entrance. 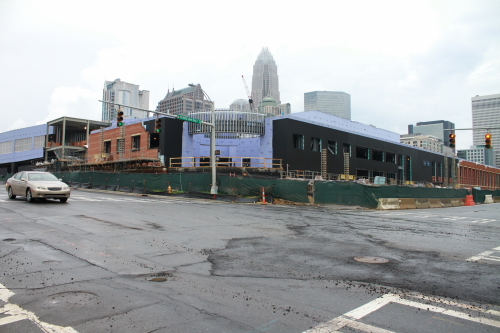 This is a look at it from across the street last year during the construction. 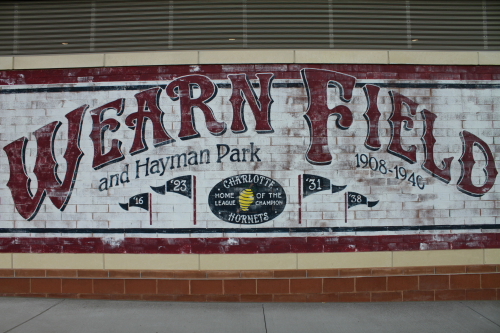 On the outside of the stadium down the third base line the have kind of tribute to the history of baseball in Charlotte. 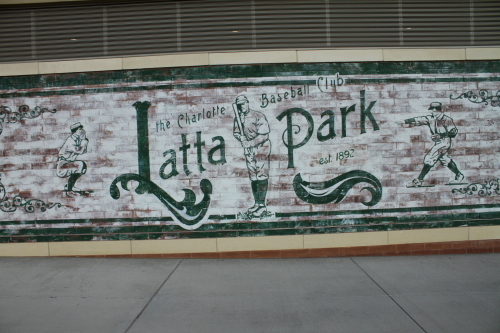 Starting with this mural of Latta Park. 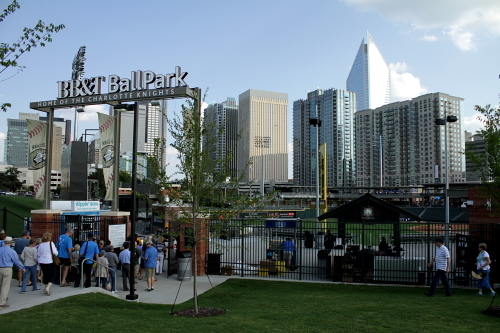 I tried finding info on this stadium but could not find anything beside that it is a park in Charlotte. If anybody knows any info or has photos of it please contact me would like to learn more about it. 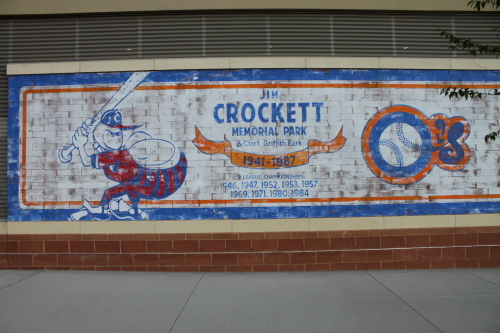 The photo pretty much give much of the info about the team name and the years that baseball was played there. 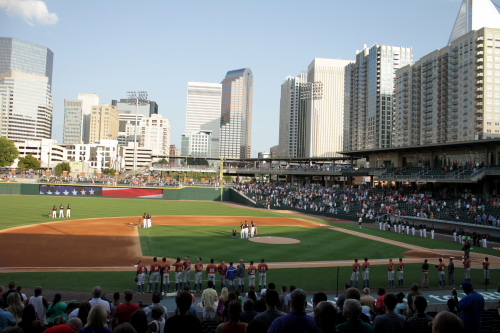 From the little bit of info I could find on this one I believe it was the stadium that the first integrated baseball game was played in North Carolina. If any body does have info once again please let me know. 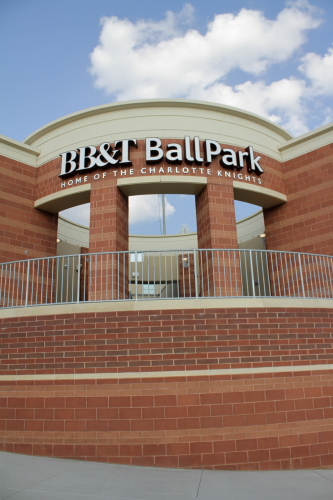 This was the stadium used before they built the Charlotte Knights stadium before the last one in Fort Mills. 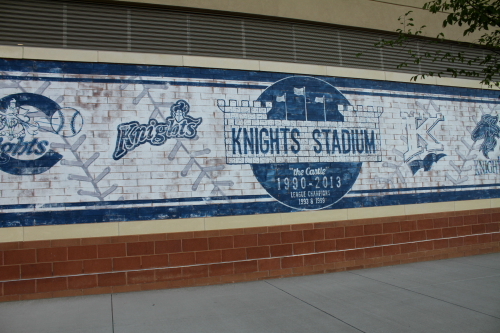 The last was the Knights stadium that I already mentioned. I still think it looked like a prison. I have seen 3 games there in 2011 all three was against the Bulls. so this is the 4th knights game I have seen and the played the Bulls every time I have seen games there. 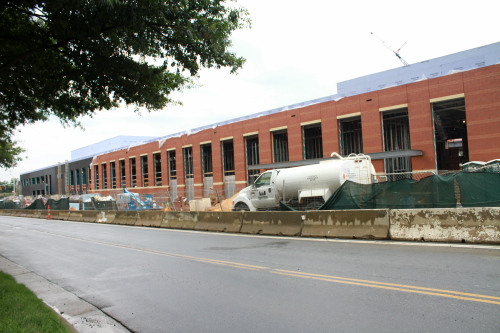 This is a photo of the entire wall during construction. 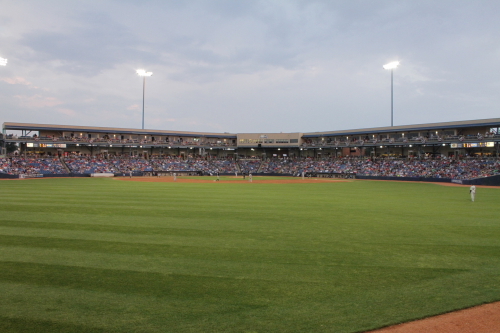 This is a look of the out side of the stadium looking from the out field to the direction of home plate. again this was from last year. 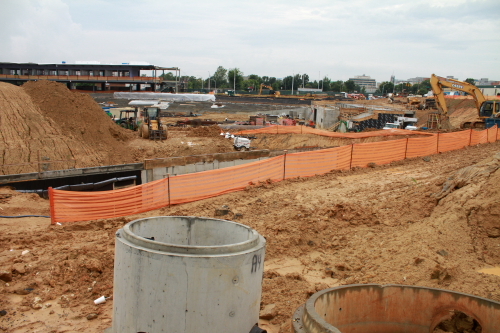 Here is a look at the same wall from home plate to the out field from this year with the stadium complete. 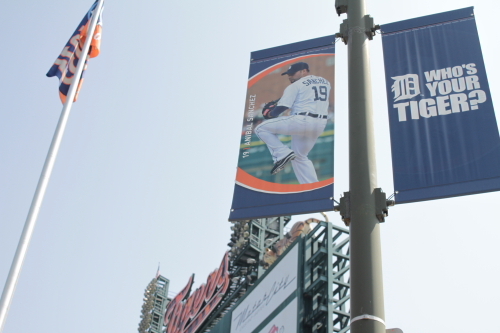 This is the right field stadium entrance. This is what it looks like now. 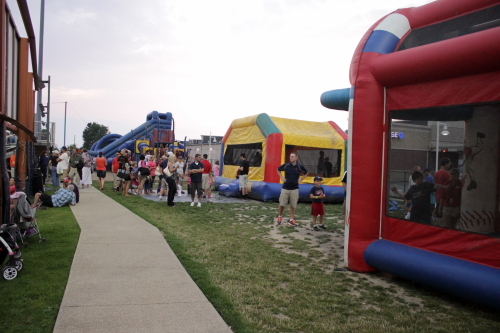 This is the entrance I entered the stadium at. Before I show those I have a few more from outside with the progress from last year to the complete stadium. 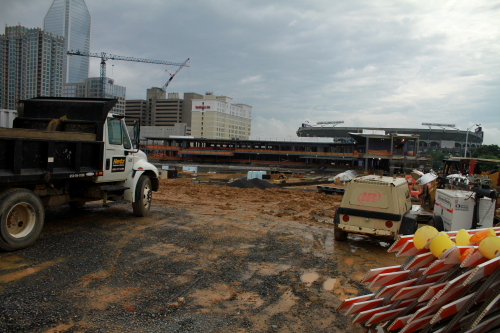 This is where the left field entrance is now. Now into the stadium. 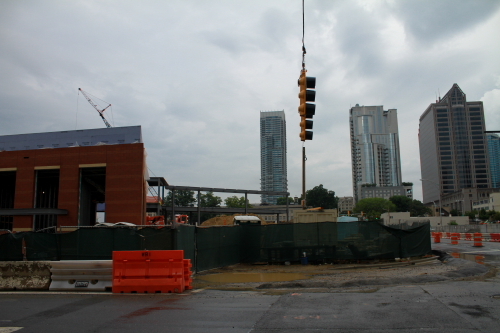 I will insert different photos threw out the game as I moved around with photo from during the construction. 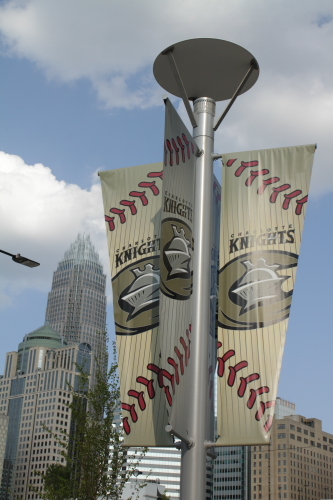 Charlotte Knight banners on light pole outside of stadium. This is what the end of the seats look like. this is a feature not many people really notice about a stadium. 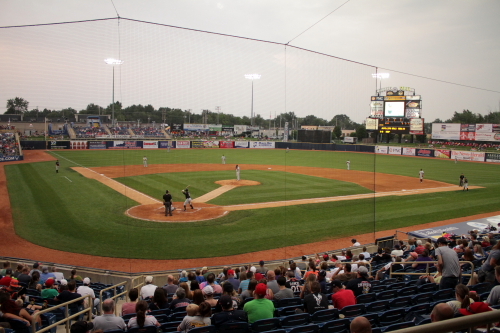 A look at the field and sky line from slightly behind home plate. 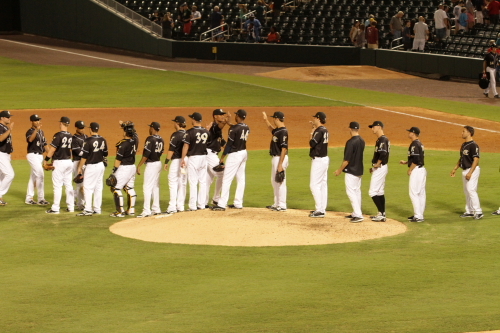 Players from both teams lined up along their respective lines during the National Anthem. Now it was time to play ball. 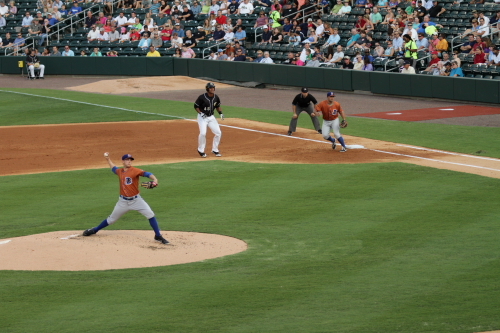 Chris Beck started the game for the Knights and he pitched very well through the first 2 innings. he sat the Bulls down in order in the 1st. and 2nd. inning striking out 3 in the 2 innings. 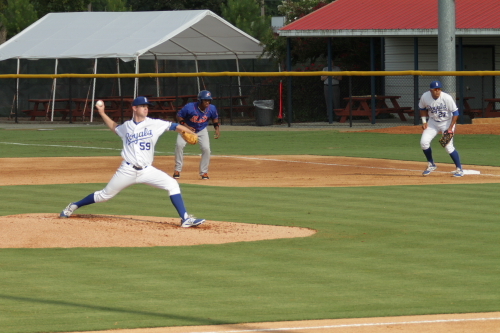 Merril Kelly started for the Bulls I saw him pitch in relief in Durham and also in the triple A All Star game. 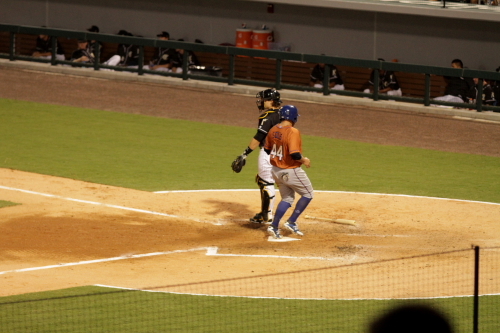 He did get the Knights first batter of the game out and then the second batter Marcus Semien hit a triple to get on base. 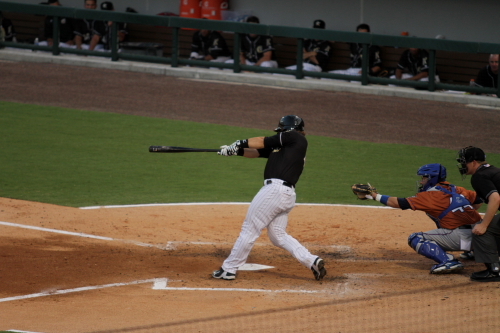 Jordan Danks would follow that up with a single that scored Siemien and put the Knights on the board with a 1-0 lead. 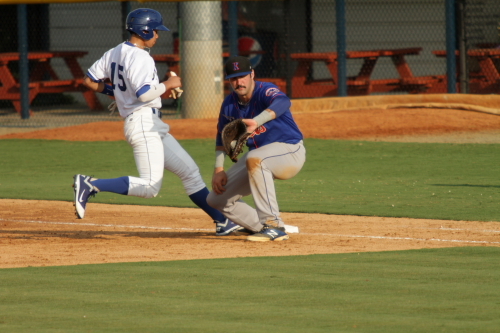 Josh Phegley hit into a double play to end the inning. 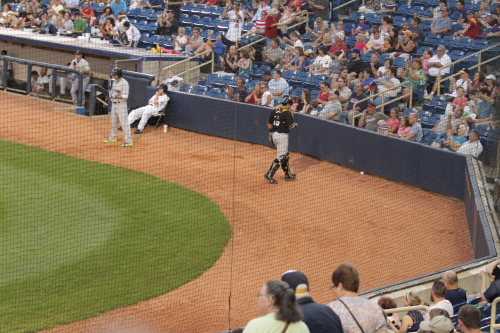 with 2 outs in the 2nd the Knights threatened to score again. 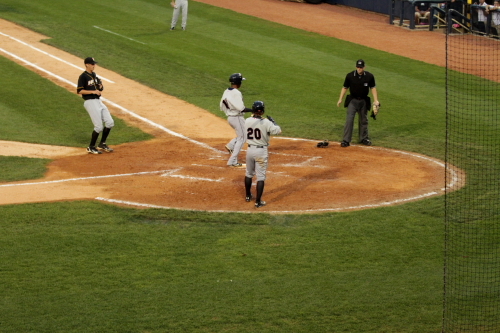 Michael Taylor started with a single and Dan Black followed with a single. 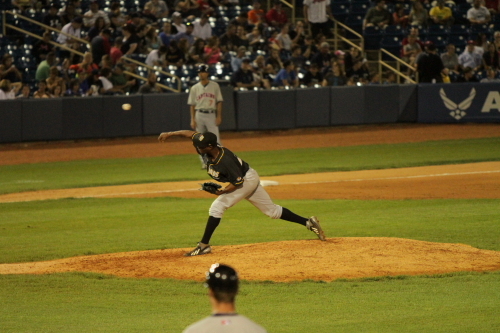 Kelly struck out Blake Tekotte to end the inning and the Knights left 2 runners on. 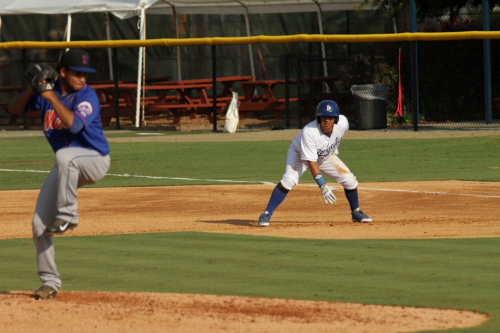 After pitching a perfect 2 innings Kelly gave up a hit to the Bulls Ray Olmedo got a single. He would advance from 1st. to 3rd. on a passed ball and then score on a balk by Kelly. 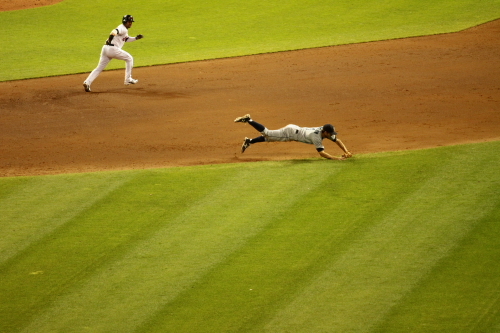 That is a rough way to give up a run and that tied the game at 1. 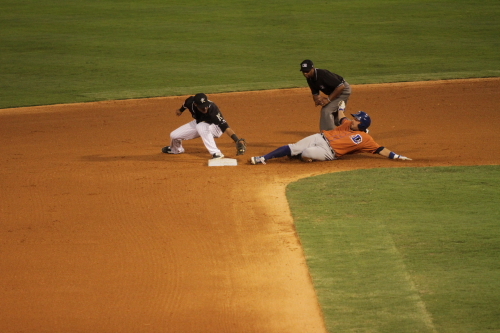 Olemedo sliding into third after the passed ball. 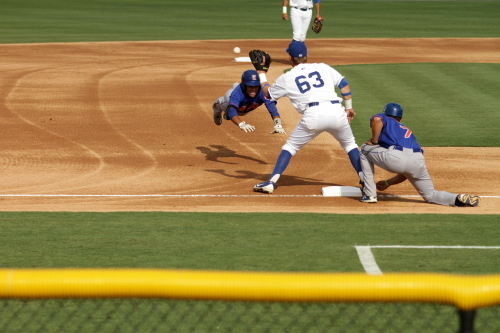 It was close but he was safe. 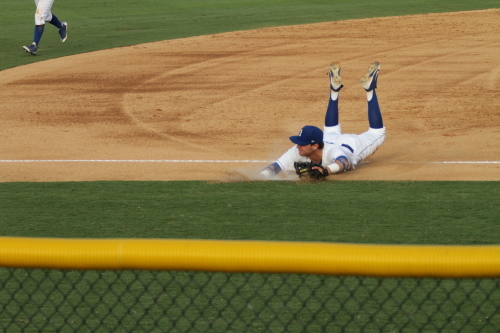 In the bottom of the third the Knights would score 2 runs on a very interesting call. 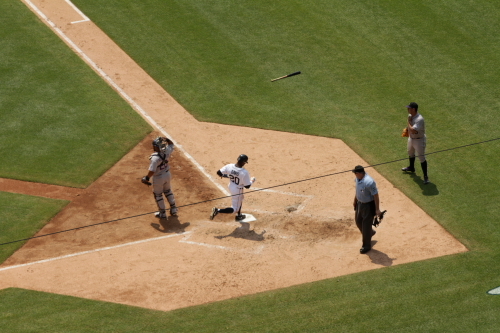 With Danks on second after a 2 out double. 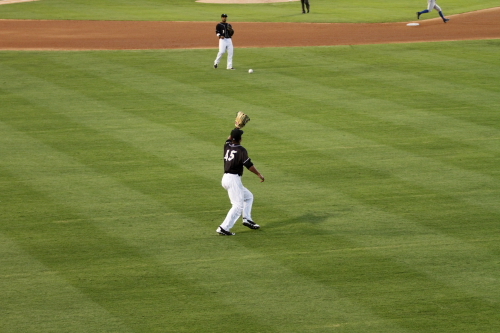 Phegley would come out and hit the ball deep to right center. Now I was not able to tell if the ball hit the rail or the wall. 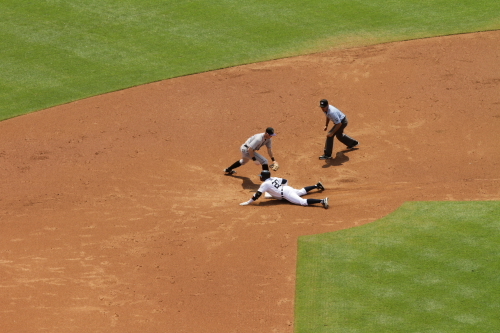 They stopped him at second and then reviewed the play. I did not know there was a review in triple a. After the Umps discussed the play it was ruled a home run and Phegley proceeded around the bases and the Knights took a 3-1 lead. 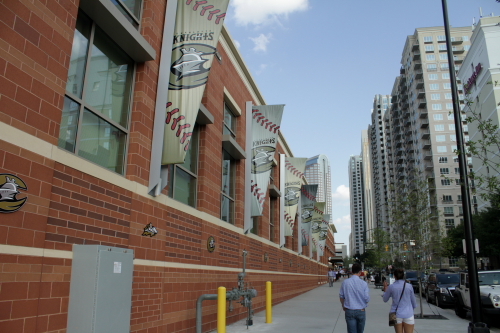 In the 4th inning I took a quick walk around the stadium. 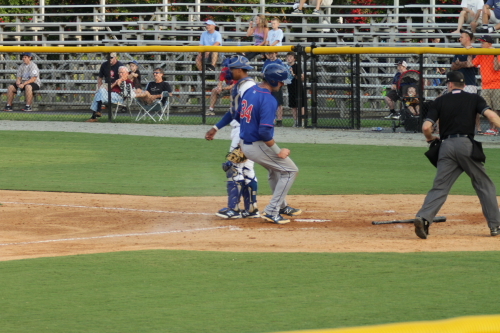 This is a look from right center during Wilson Betemit at bat. 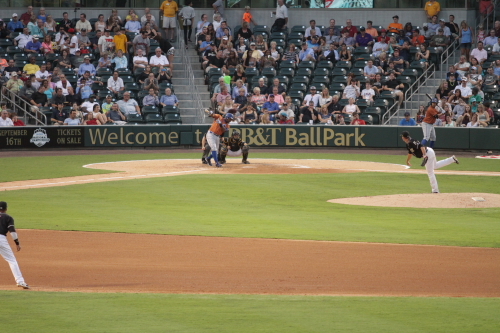 He ended the inning with this fly out to Taylor in right. 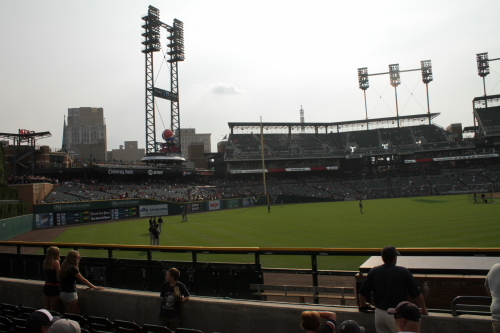 This is a look of the stadium from what know is around center field. 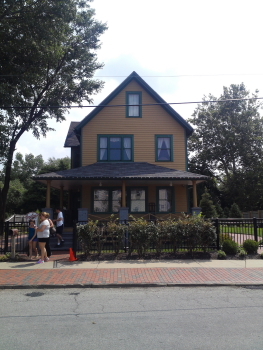 This photo was taken either over or through the fence from the street. 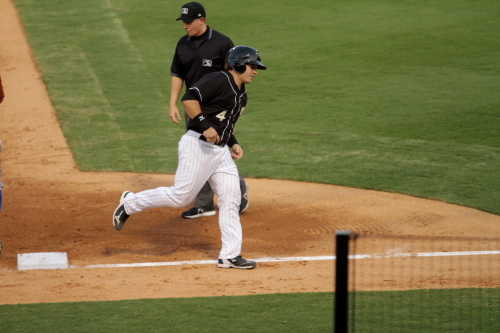 Matt Davidson grounds out in the 4th inning. 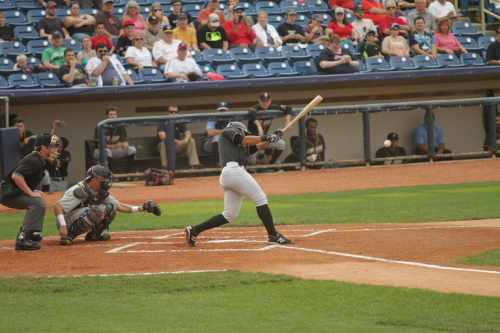 Ali Solis gets a double in the 5th inning. 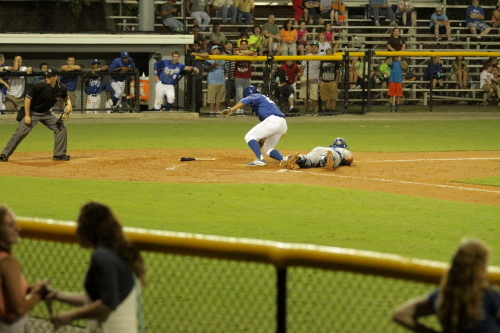 He was safe on the slide. 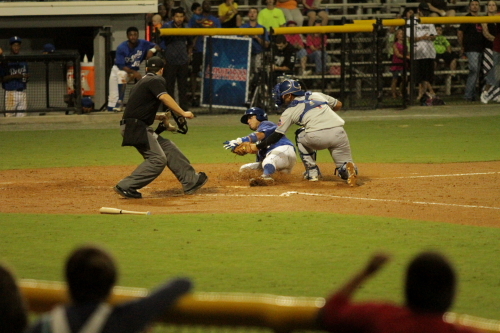 He would score on a Olmedo single 2 batters later. That gave the Bulls their second run of the game. The Knights still held a 3-2 lead. Siemien hit a solo homer in the bottom of the 5th to extend the Knights lead to 4-2. The Knights also have their own creepy mascot race and this one was not so bad. It is Jerry the Jester who is in the lead in this one, king Mecklenberg and Queen Charlotte all character having to do with Charlottes history (somewhat) I know Queen Charlotte is, Mecklenberg is the name of the county the city of Charlotte is in. 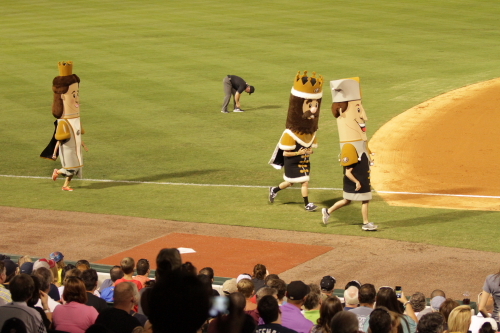 So Jerry was winning till the Knights mascot knocked him down and King Charlotte won. He leads the season with 22 wins closely followed by Queen Charlotte with 21 and Jerry the Jester has 10. 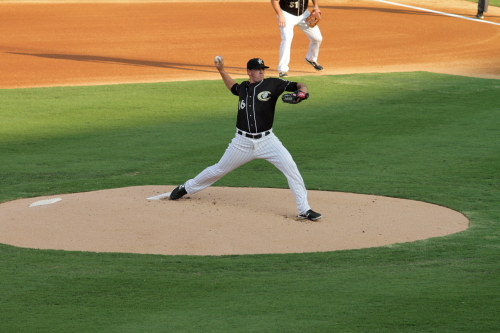 The Bulls brought in their second pitcher of the night Doug Mathis in in the 6th inning. Merril gave up 4 runs on 7 hits in his 5 innings of work. He did strike out 5 and walked 1. 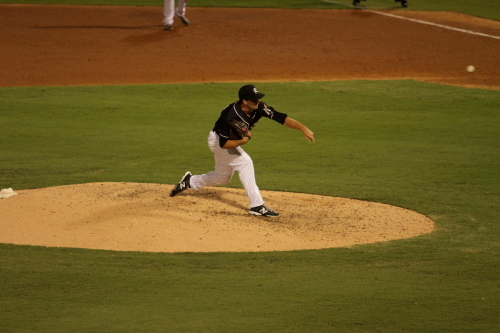 The Knights brought in a second pitcher in the 6th inning as well Matt Zeleski. 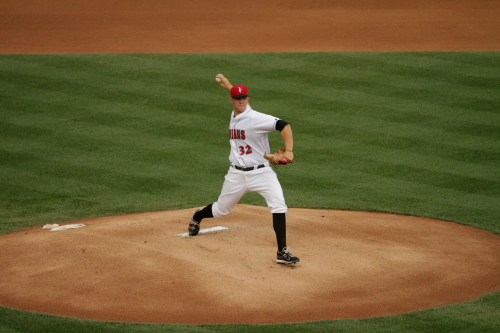 Chris Beck their starter went 5 giving up 2 runs on 5 hits and did not allow a hit till the 3rd. He struck out 5 and walked 1 also. 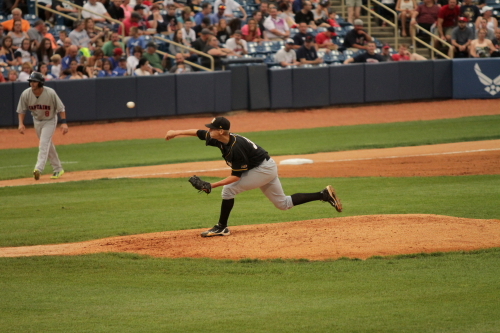 Zeleski pitched 2 inning holding the Bulls and allowing only 1 hit. Jarrett Casey pitched the top of the 9th for them. 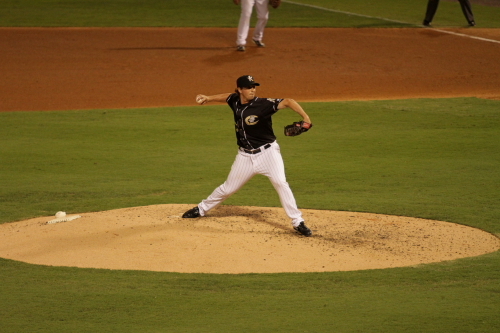 Casey did give up one hit to Olmedo who was 3 for 4 tonight breaking up the no-no in the 3rd and an RBI in the 5th. 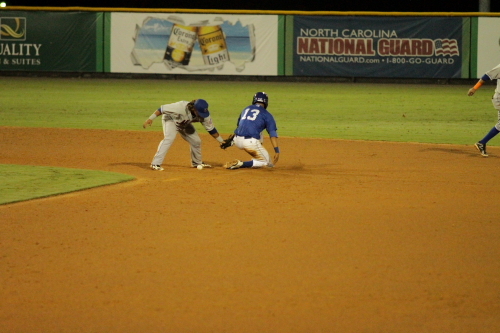 Robby Price came up with Olmedo on second. 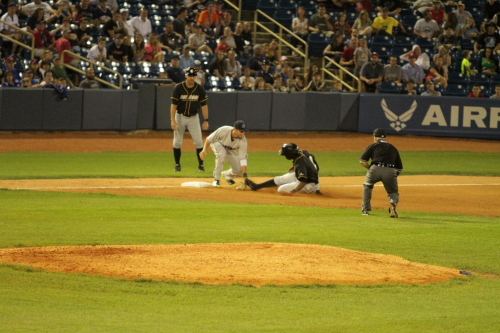 He flew out to left to end the game and the game was over and the Knights won 4-2. The Knights celebrate their win. this was a pretty cool stadium. It does sell out and this night there was only general admission and standing room only seats which the general admission is for outfield seating and standing room only is for where ever you can stand. It was a pretty cool stadium that had features of many stadium I have been 2 before. 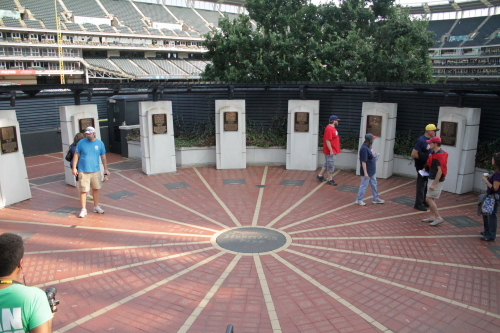 Like the Home Run porch which reminded me of Columbus and they had a lot of group areas. 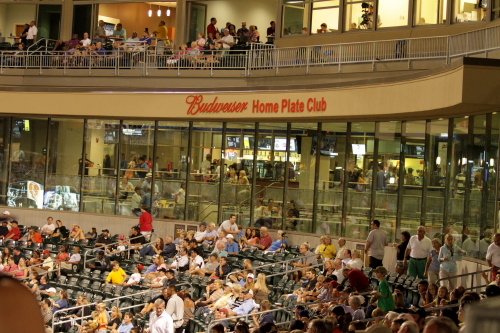 Like the Budweiser Home Plate Club and the Diamond Direct Lounge on the second level along the first baseline. 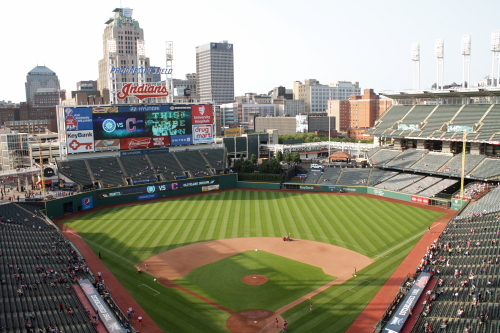 So that is it for this one I will be in Cleveland for an Mariners vs. Indians game on Thursday night! Two for one in Burlington. 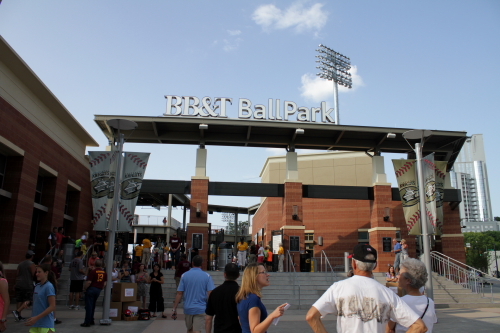 Burlington Athletic Stadium, Burlington, N.C. This one is taking awhile to put together one I had a travel day and 2 it was a double header with twice as many photos and well twice as much of everything. 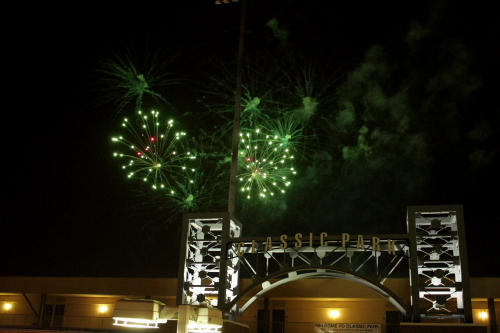 This being a Minor League doubleheader it is 2 games of 7 innings. So the game was schedules to start at 5P.M. and when I went to get my ticket at the ticket booth I asked what time will the game be staring and they said probably around 5:20 it was suppose to start at 5:00 but the Umpires are not her yet. This was at about 4:50! So I headed in about 10 or 15 minutes later since it is a small grandstand stadium, there is not much to see and I have been her before this is actually the third time I have gone to a game at Burlington I went to 2 games there during my 2012 trip. 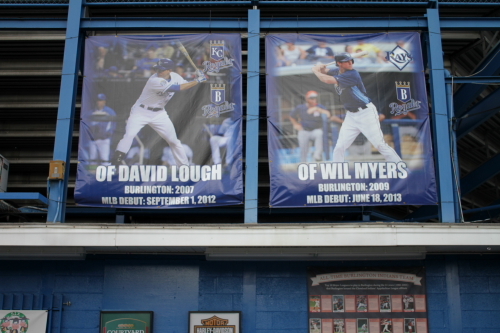 So like many Minor League parks they have something to show guys that played there that have made it to the Majors and these banners show some reason guys who have moved all the way up. 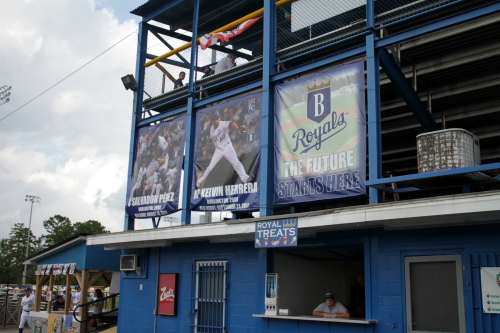 Many with the Royals and Well Will Myer with the Rays other notable players that played in Burlington are Jim Thome, Manny Ramirez, Bartolo Colon and C.C. Sabatthia. I learned this just from using the rest rooms at the stadium! Always find this funny and always pee in Manny’s locker! 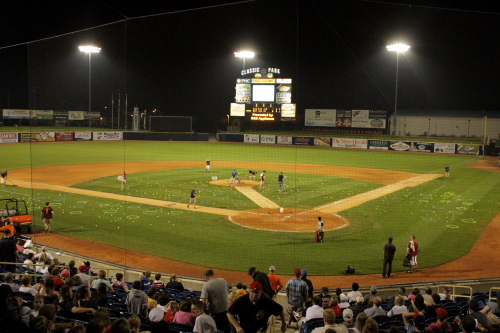 So it was time to Play Ball, after the umpires arrived of cause. Carter Hope was the starting pitcher for the Royals this game only faced 3 Mets batters. 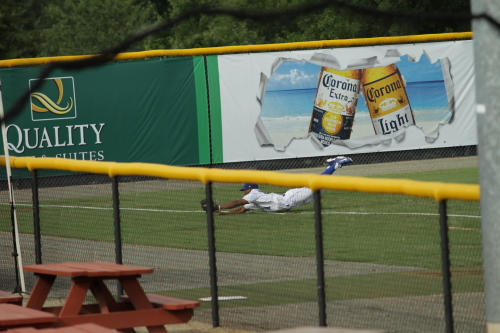 The first was a great catch by left fielder Leland Clemmons hit by Luis Guillorme. 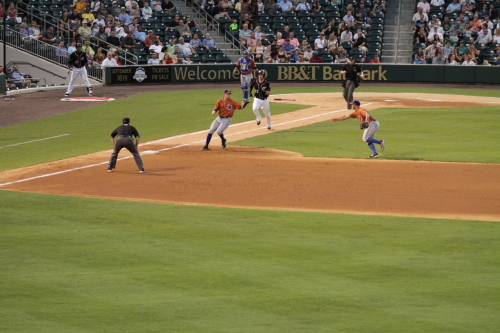 …for the out at third. 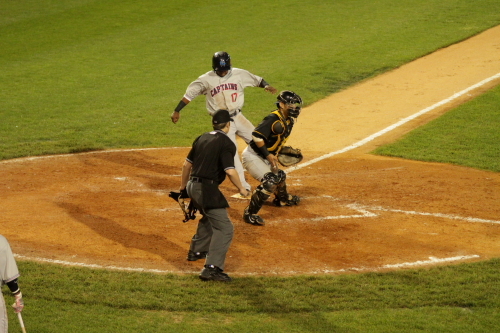 Yoryi Nuez started for the Mets, he started the game by hitting Leland Clemons. 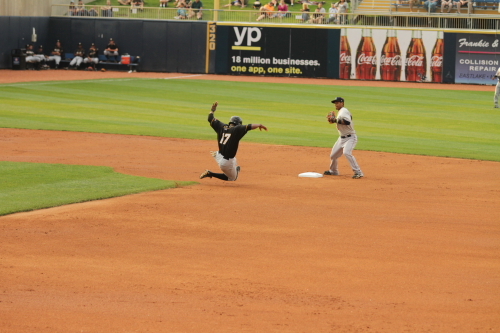 Clemons then stole second. The next 3 batters would get out and he did not score. 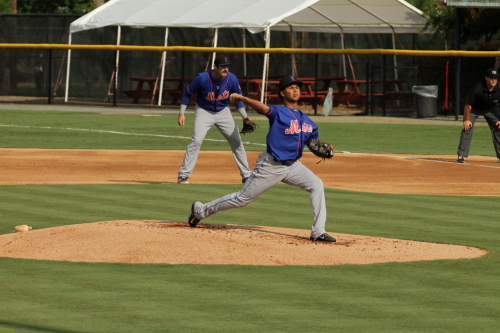 Pedro Perez the second batter of the 2nd inning for the Mets walked. 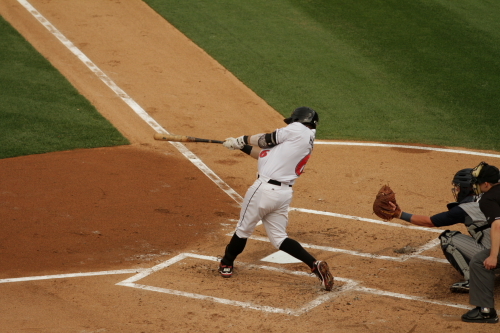 Here he is on base while Hope is pitching to Wuilmer Becerra. 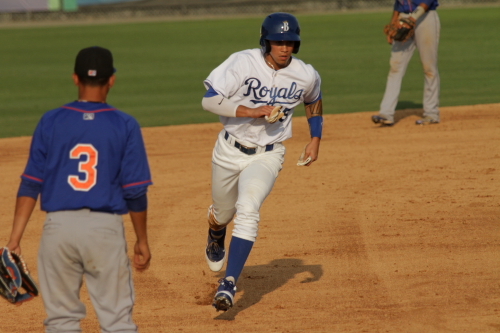 Becerra would reach base on a error by the Royals short stop Jose Martinez. 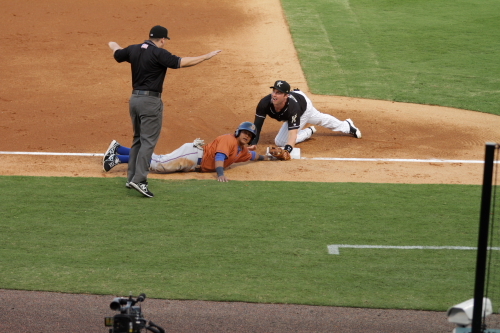 Perez sliding into second on the error. 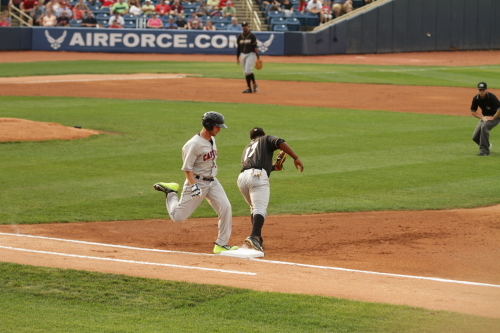 Hope would then walk Zach Mathieu to load the bases with 1 out. 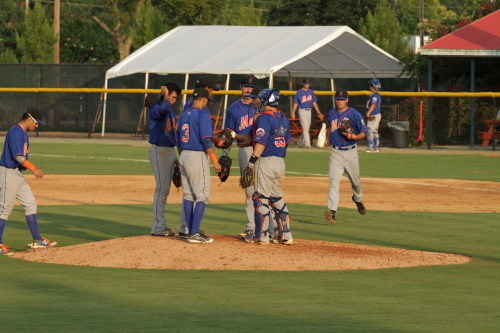 He then work his way out of the inning very nicely first Miguel Leal flew out to right field and then he struck out Ivan Wilson to end the inning with out the Mets scoring. 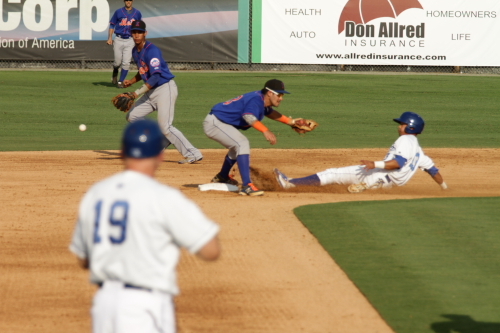 In the 3rd inning after being hit by a pitch Angelo Castellano steals second and the ball was missed by the Mets short stop Leal. 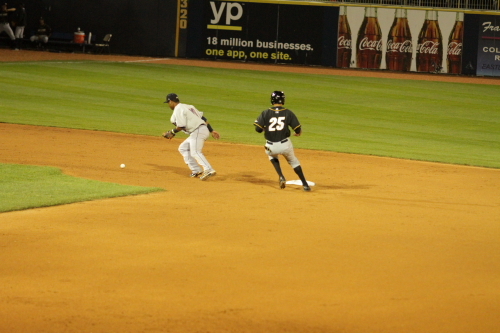 Castellano easily made it to third. 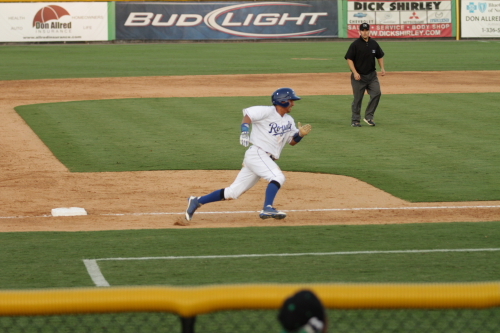 Jose Martinez hit a single to score Castellano to give the Royals a 1-0 lead in the third. 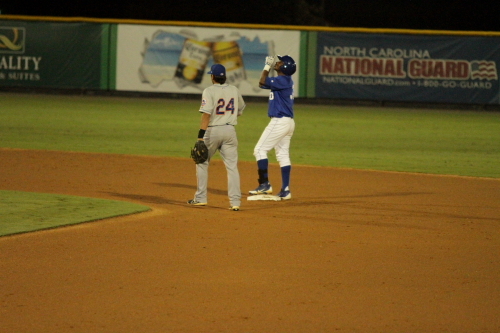 Martinez on first with Nuez on pitching, Martinez would advance to second on a wild pitch. 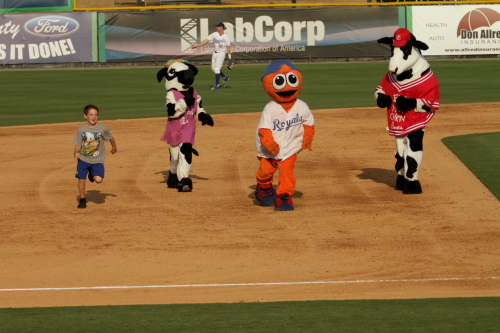 Between inning they had their version of the mascot race were their mascot Bingo races with 2 chick-fil-a cows and a kid and the kid wins! 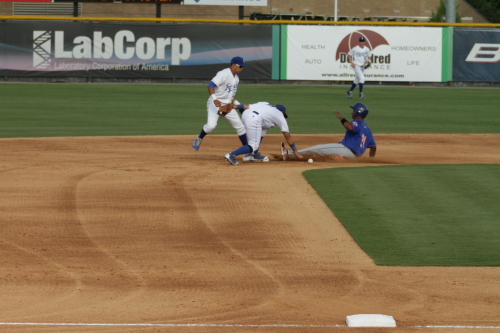 The Royal scored a second run in the 4th inning Joshua Banuelos started the inning with being hit by a pitch. He would score on a Ryan Dale single 3 batters later to give the Royals a 2-0 lead. 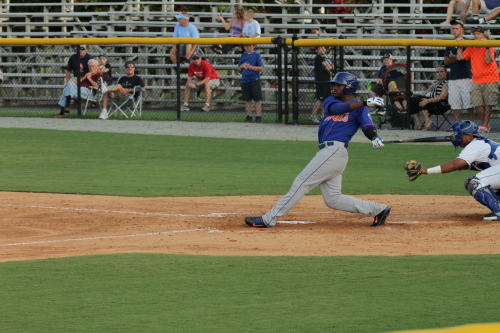 Amalani Fukofuka hit a single in the 5th and he is a throw over to first. 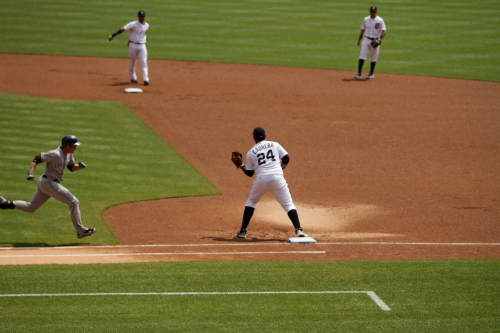 He would steal 2nd but be left on base. 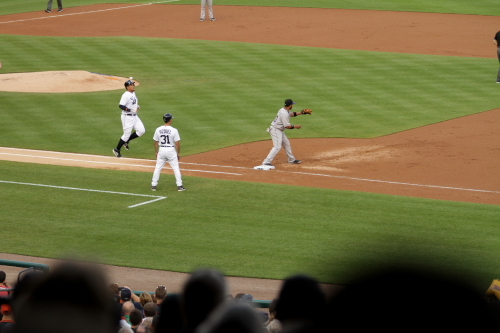 This is a photo of him running it out during a fly out to end the inning. 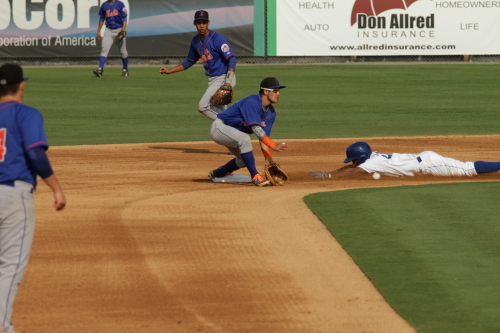 The Mets got things going in the 6th inning with 2 out first Mathieu walked and Leal singled. 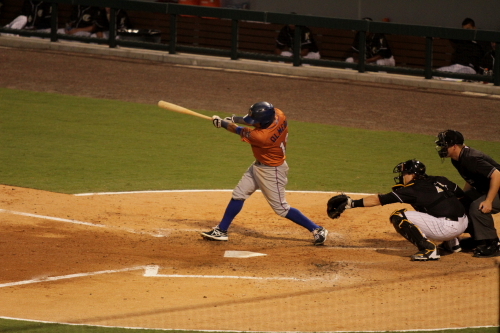 Ivan Wilson would hit a double down the 3rd. base line. That would score Mathieu and Leal. 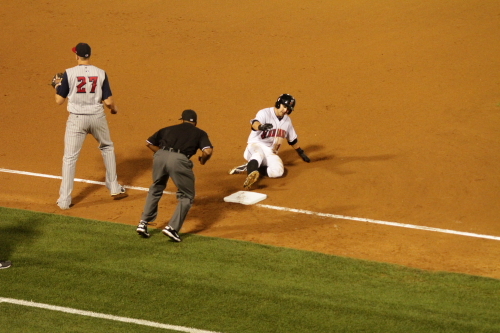 Mathieu crossing the plate for the first run and then Leal scored to tie the game at 2. Pitched the 6th inning for the Mets he was the Mets 3rd pitcher of the game. 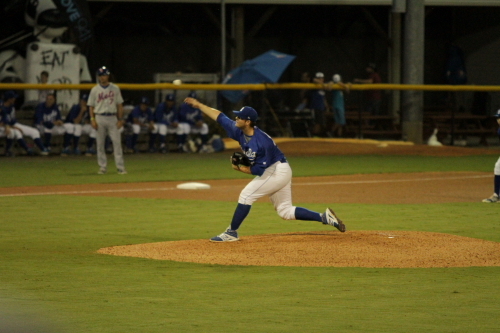 Their starter Yoryi Nuez pitch 4 innings giving up 2 runs on 2 hits with striking out 3 and walking 1. 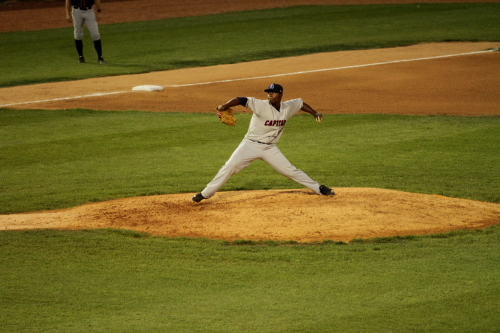 Their second pitcher of the night was Ramon Esteves who pitched the 5th inning. 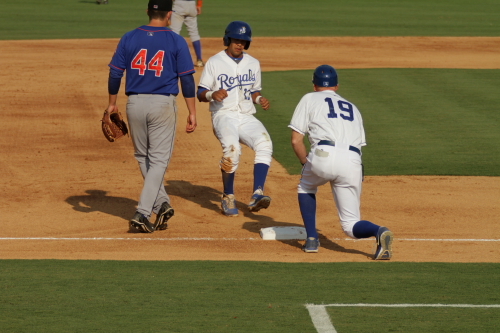 In the bottom of the 7th the Royals got a runner on base and Castellano layed down a sac bunt. 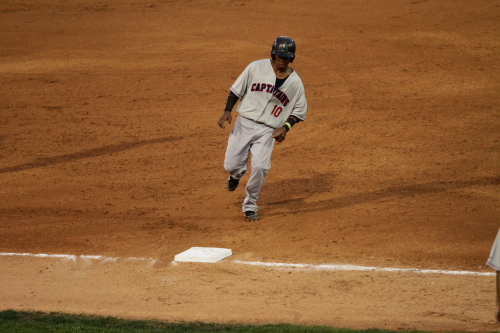 Advancing D. J. Burt to second who came into pinch run for Ryan Dale. The Royals would not win this one since it was a 7 inning game with a walk off and we head into extra innings. Bryce Beeler would come into pitch for the Mets in the 7th. Martinez stole second during Cleomons at bat he stole second then he stole third during Fukofukas at bat that was a wild pitch and he headed home. he scored and the Royal won game 1 in 10 innings 3-2. 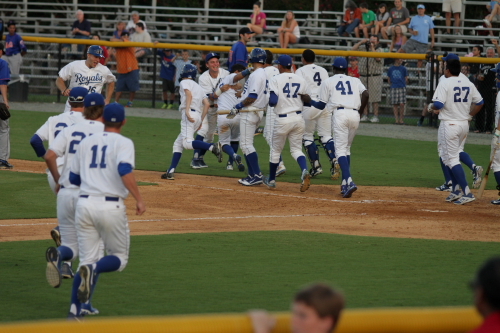 The Royals dugout cleared as they celebrated down the first base line. 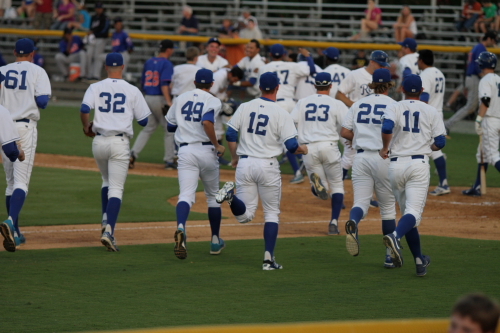 The Royals bullpen heading into celebrate with their team. So that was it for the very long game one, considering this was suppose to be a 7 inning game and went 10. There was still the second game. 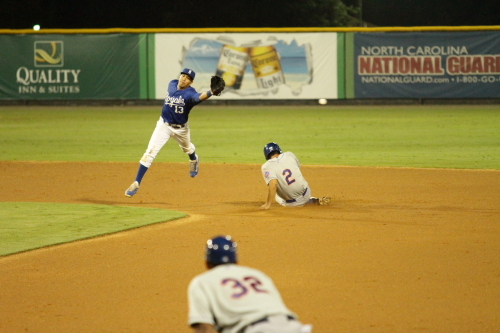 The second game was a make up game for a rained out game last week in Kingsport. Between games a few players stopped and spoke to fans and gave autographs. 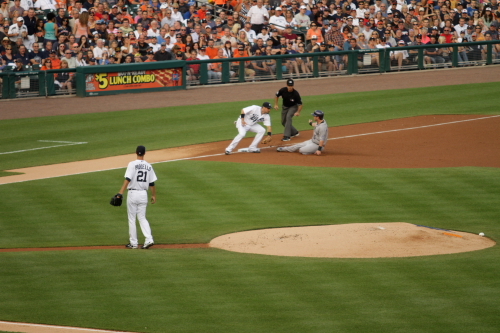 To change it up a little I sat on the 1st base line for this game. 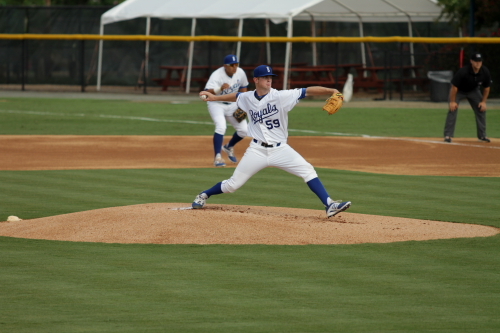 Chase Darhower started the second game for the Royals. He sat the Mets down in order getting all 3 batters to fly out. 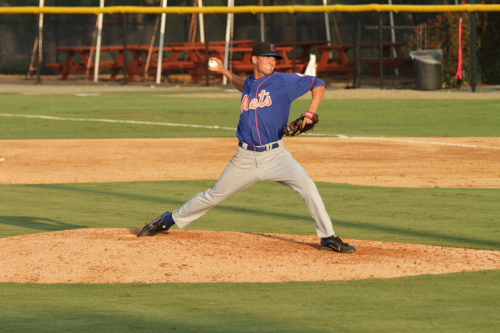 Andrew Church started for the Mets. After getting the first 2 Mets out he hit the Royals 3rd batter of the inning with a pitch and got out of the inning on the next batter. 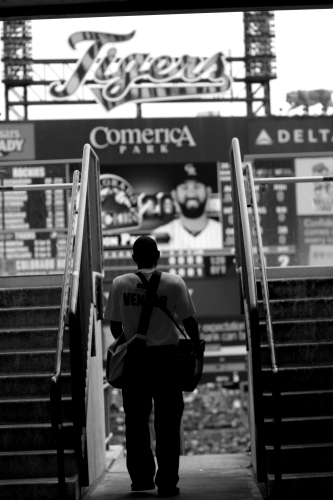 The Mets bull pen looks on during the first inning and the creative BNW for this way to long of a post. After getting on base with a single Wuilmer Becerra stole second with 2 outs and made it to third because f a throwing error by the catcher. 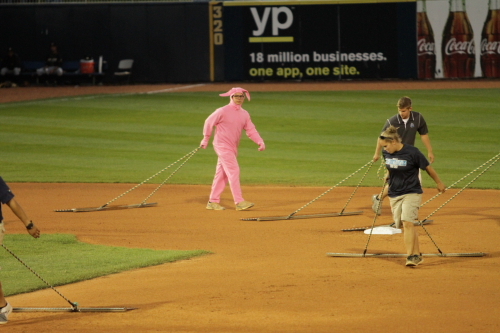 He easily made it to third. 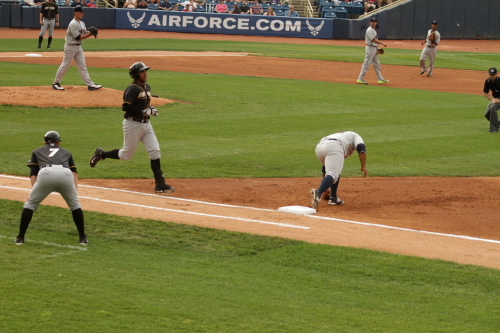 He did not score and was left on base. 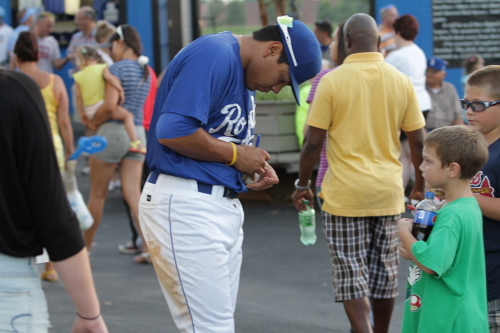 Cristian Cano started the 2nd for the Royals with a 1 out double. 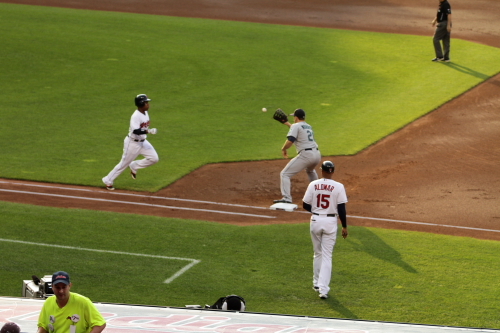 Cano would advance to third on a throwing error from Branden Kaupe. 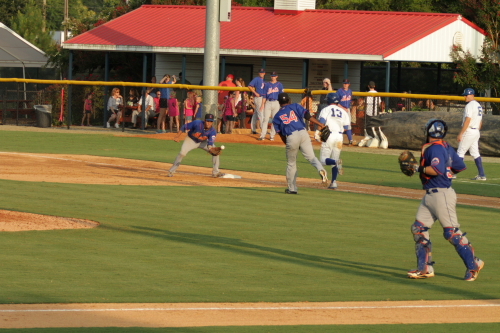 Riley King hit the ball and would get on first. 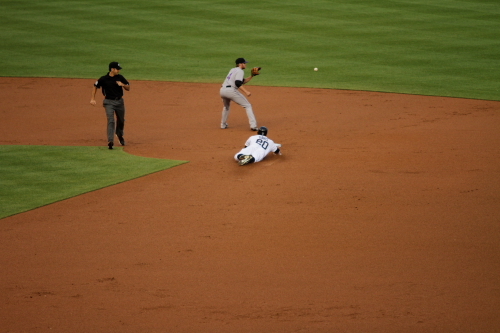 Cano tagged out at home on a Luis Lara hit. 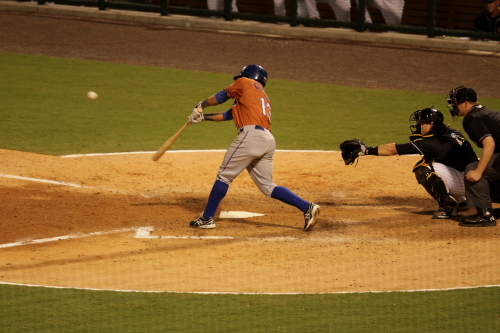 Angelo Castellano would hit a single to load the bases. 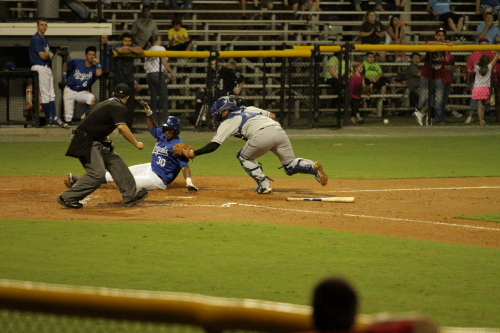 Manny Olloque scored on a Logan Moon single to give the Royals a 1-0 lead. 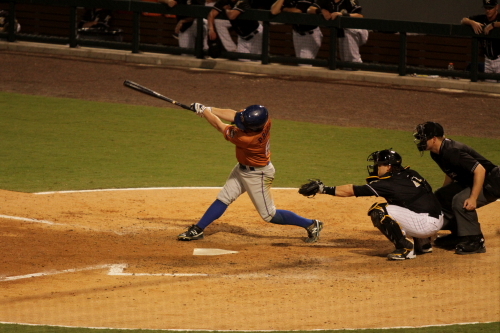 …but was tagged out at the plate. The Royals had a huge inning in the 3rd. To make this simple they scored 6 runs on 5 hits in the inning. 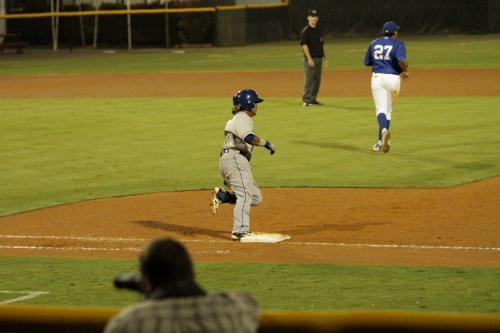 Jose Martinez lead the inning off with a double, Chase Vallot walked Martinez scored on a Banuelos single. 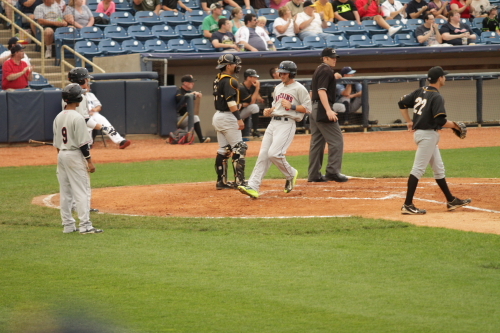 Vallot scored on a Cano single. 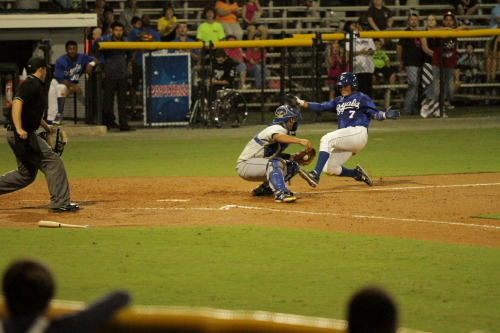 Here is Banuelos scoring as the ball heads towards the wall when the catcher missed it. King scored and the Royals had a 5-0 lead Cano would than score on a Lara single to give the Royals a 6-0 lead. 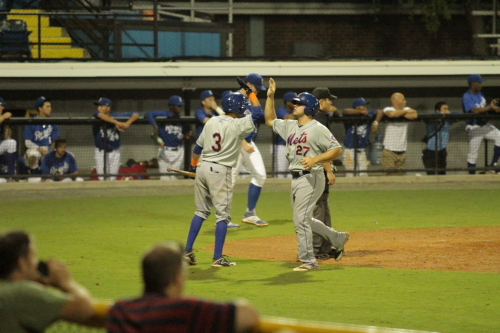 The Mets got on the board in the 5th with a Branden Kaupe triple. 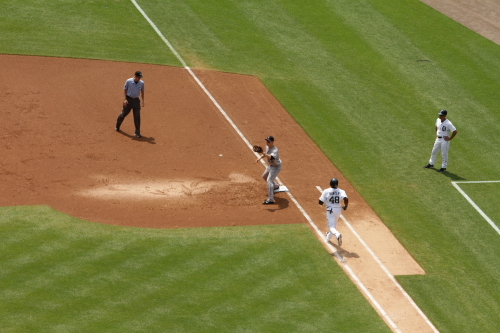 Here he is turning at 1st. 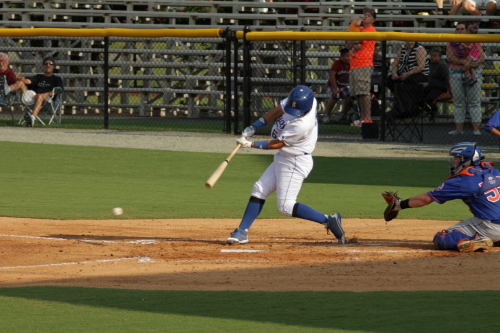 Wuilmer Becerra and Vicente Lupo scored cutting the Royals lead to 6-2. 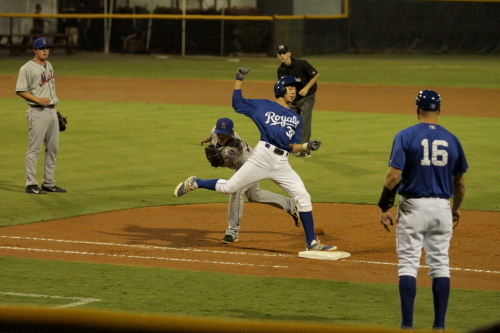 The Royals would score a 7th run in the 6th inning after Castallaano hit a reached base on a fielders choice getting Lara out at home, he stole second and scored on a Martinez single a few batters later. The Royals had a bunch of base runners this inning but was only able to get 1 run. 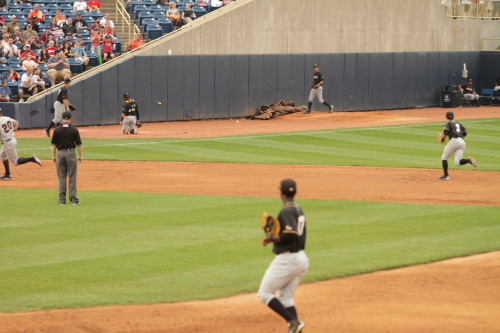 The last 2 batters flew out stranding 2 runners. Andres Muchado pitched the 7th inning for the Royals and he was the 3rd pitcher for them this game. 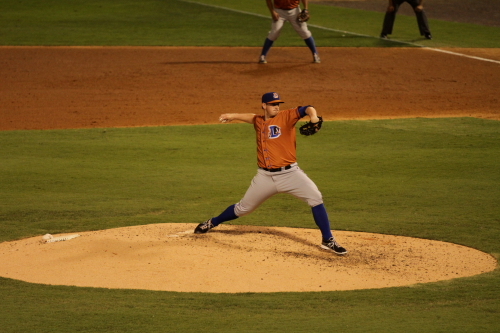 The starter Chase Darhower went 5 innings giving up the 2 runs on 3 hits walking 2 and striking out 3. 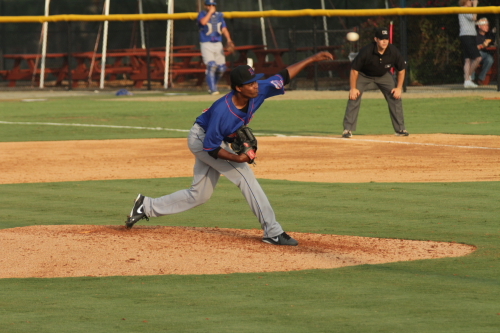 Their secon pitcher Antonio Cruz pitched the 6th and struck out 2. 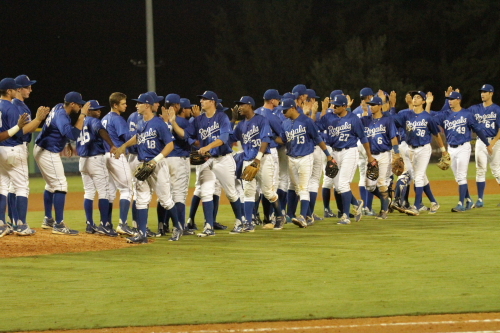 Since this was a double header they only played 7 innings and this game was over with the Royal winning 7-2. The Royal celebrate their second win of the day! Once again the games were exciting in Burlington they always seem to be when I go and see games here. Last time I saw a no-no go till the 9th inning with 2 outs and a full count before the pitcher gave up a homer for the only hit of the game and this semi marathon double header. 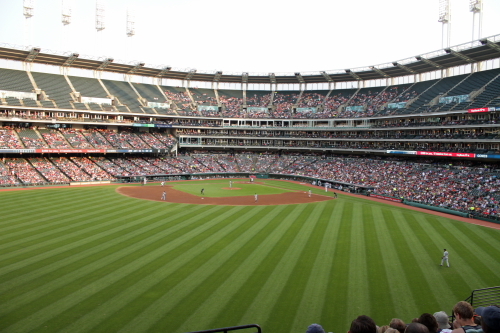 This is a really fun stadium to catch a game you are close to the action and it always seems like there is a lot of it. So that is it for this one, I have a few days off before my next game in Charlotte to check out their new stadium downtown.